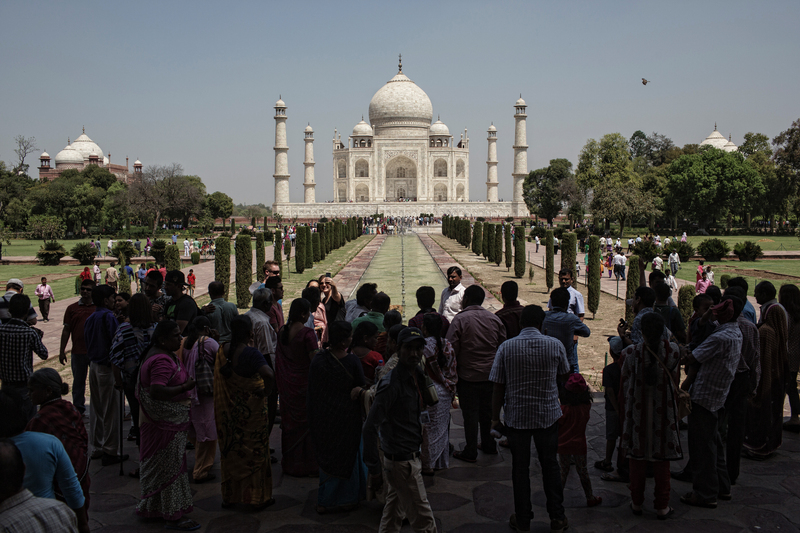 The great country of the Taj Mahal, of vast deserts and ancient imposing fortresses, of beautiful coastlines and vibrant cities and the sacred Ganges river. A billion people and more spread amongst the plains, deserts, deltas and cities that is known the world over. But look to the far north, where the high hills rise and rise to become part of the mighty Himalayan mountain range – resides the small city of Leh at an altitude of 3500m in the Indus river valley, of the beautiful Ladakh region. Once a hugely important trading city serving as the crossroads between Kashgar in China, Kashmir in India and Tibet – the city of Leh is considered one of, if not the only city in the world where Muslims, Buddhists and Christians live harmoniously together for many centuries; a testament to its diverse and rich history as part of the Silk Road, and seeing trade and influences from both East and West melding together over time. 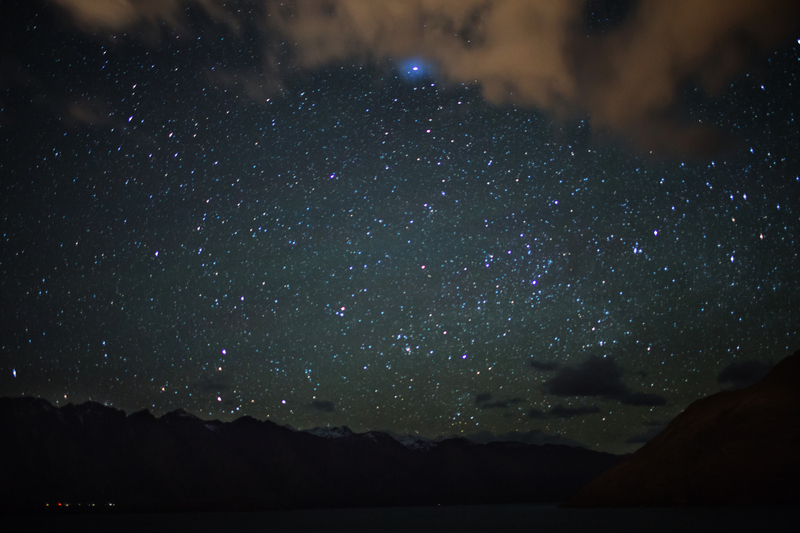 The first few days for any traveller or trekker upon arriving in Leh, is acclimatizing for the high altitude. Unlike the start of the Inca trail hike to Macchu Picchu or Everest Base Camp walk which both sit at much lower altitudes to start, upon landing in Leh by plane you are thrust into a much higher altitude from the start, which can be disconcerting to many, even experienced trekkers in the first 48 hours. The imposing and beautiful Palace of the Kings of Ladakh overlook the small city, this served as our reference point to navigate around the town centre on foot, albeit with the occasional slips and falls due to the icy conditions. Traveling to Leh in mid winter is beautiful, but many shops and restaurants were also closed for the season, but fortunately essentials for trekking and daily comfort is still easily accessible. I remembered during the hair-raising landing and turbulence coming into Leh, I noticed a huge monastery perched upon a hill away from the city. Upon investigating it was the famous Thikse Monastery – and a day trip was quickly on the cards. For world weary travellers, Thikse Monastery bears a strong resemblance to Potala Palace in Lhasa, Tibet – in other words, it was a beautiful and sombre sight to behold, and seeing young Buddhist monks no more than 10 years old playing in the icy snow, as older monks carry back supplies from the nearby town before sunset, was an unforgettable experience. Perhaps the most unexpected and unusual sight in Leh during our acclimatisation phase, was seeing the Guinness World Record being broken for the highest altitude ice hockey game ever played between two professional Indian teams. We accidentally stumbled onto this sporting event by curiously following large crowds of people heading in the same direction, and it had seemed half of the city’s population was there too, shivering, huddling together but enjoying a tense game of ice hockey at high altitude. After several days exploring the city and its surroundings in our high altitude acclimatization period, we were almost ready for the Chadar Trek. Some last minute shopping saw a rush to buy Gumboots for the trek, crucial for the river crossings we will have to face in minus temperature. In hindsight, we should have bought Gumboots back in Australia – as they would have had better cushioning, better traction on the soles, and most of all – insulated fur linings for the extreme cold. The local Gumboots in comparison were of much inferior quality, but we had no other choice but to wear them. Early next morning, it was a 3 hour drive to the famous frozen river and the start of the Chadar Trek, it was to be one of the most unique experiences of our lives. Humans are an unpredictable species. 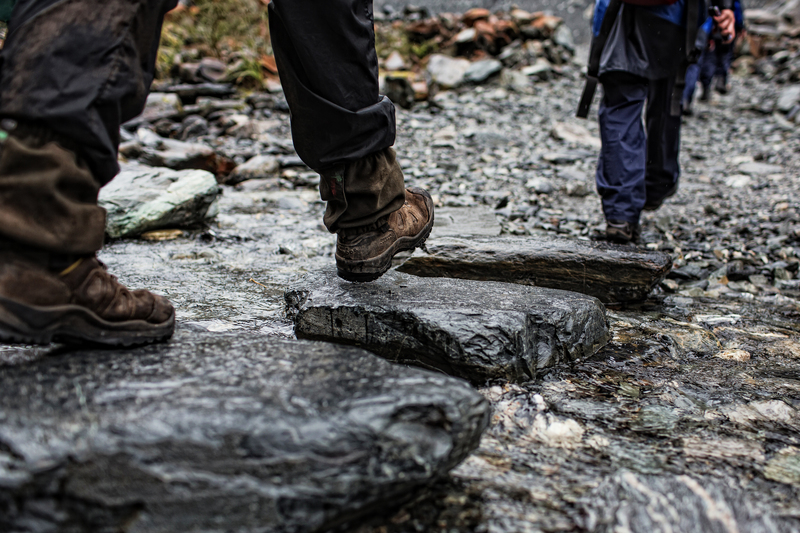 Occasionally we forsake the creature comforts of our modern society and community – the luxuries of warmth, electricity and social media – and simply don a backpack and a pair of boots and climb things, the taller the better. I found myself in Reykjavik, Iceland at the end of August 2016. I had heard stories of spectacular out-of-this-world mountain ranges and hills that are unlike any other environment on Earth. I had to climb it. A journey of 37 hours flying and transiting from Adelaide to Dubai, to London, to Dusseldorf and finally Reykjavik – my first impression was wow, the airport of Keflavik – 40km outside of the capital city of Reykjavik was quite funky and hip, and free wifi! Which led me to my first duty-free purchase in over 3 years – an assorted bag of 25 mini chocolate bars such as Mars, Snickers, Bounty etc. This ‘strategic’ purchase was not to satisfy my sweet tooth but simply for glucose and carbohydrates for the impending trek – energy for when we are on the move. 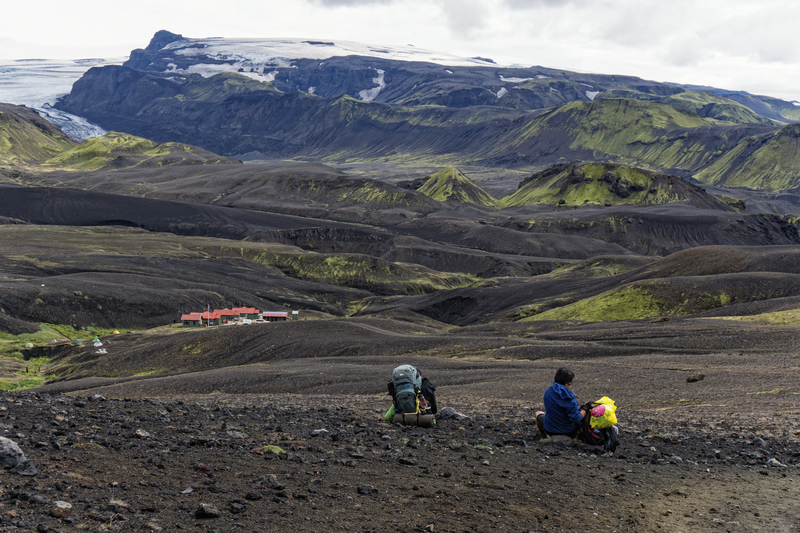 As with 99% of travellers and tourists arriving in Iceland – I caught the bus into the capital city, which I then transferred onto a van with a few sleep-deprived Europeans to be dropped off at our hotels and hostels individually. This is a fantastic service that runs through most of the night and reminiscent of the tourist-centric transportation network that covers Iceland. As a working photographer, I decided on bringing the Sony A7RII for landscape photos, and the smaller Sony A6000 for general purpose photos. It turned out, by the end of the trek, the A7RII did not leave the comfort of the camera bag at all along with the tripod, and all the photos you will see below were taken with the Sony A6000. 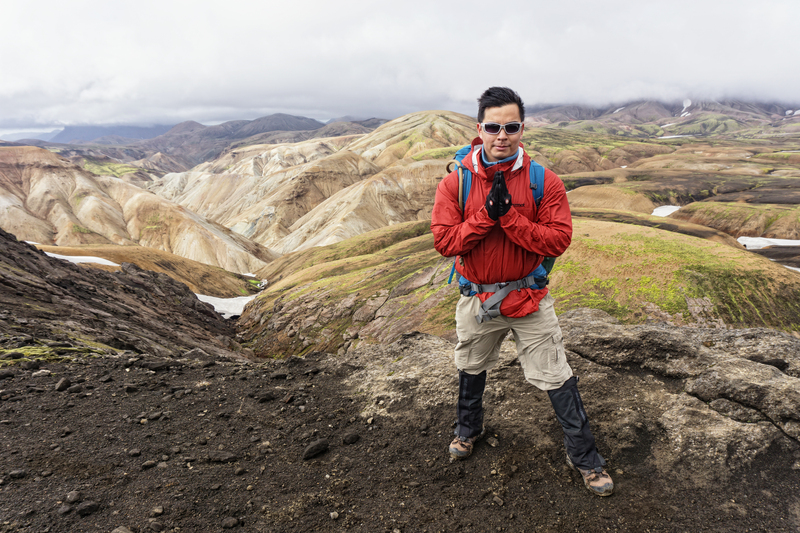 My reasons for not using the bigger camera was due to the constantly changing weather conditions we encountered, and the speed of which we were walking every day, which would have made setting up the camera and tripod tedious and time consuming. I carried an extra 3kg for nothing. This supplemented our 12 packs of military MREs (Meals Ready to Eat) – which I had arranged for Linh to purchase in New York City before flying over. I had found 12x new 24 hour ration packs of the US Military on Ebay for around $40USD – which is a huge bargain when it comes to camping food. Each pack consists of a main meal + fruit snack pack + high energy cookie + cheese and crackers. The main meal is self heating via an ingenious heat pack which reacts to a sachet of sodium water being poured in and will reach boiling point for around half an hour – you simply place your meal pack inside and let it heat for 10-15 mins. 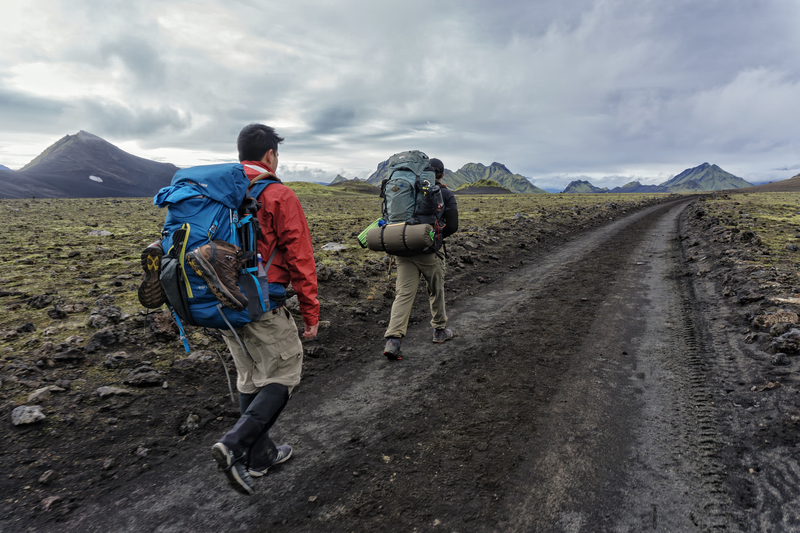 If you are planning to buy similar MREs for trekking, take note that each pack is over 2000 calories – designed to sustain a soldier in the field for medium to heavy physical activities over 24 hours. If you plan to eat them at base camps and not engage in many activities, you will inevitably gain weight. Also take note that MREs usually lead to constipation due to the highly processed food content inside. If you have a sensitive stomach I strongly suggest trying a few first before carrying them on any hike. 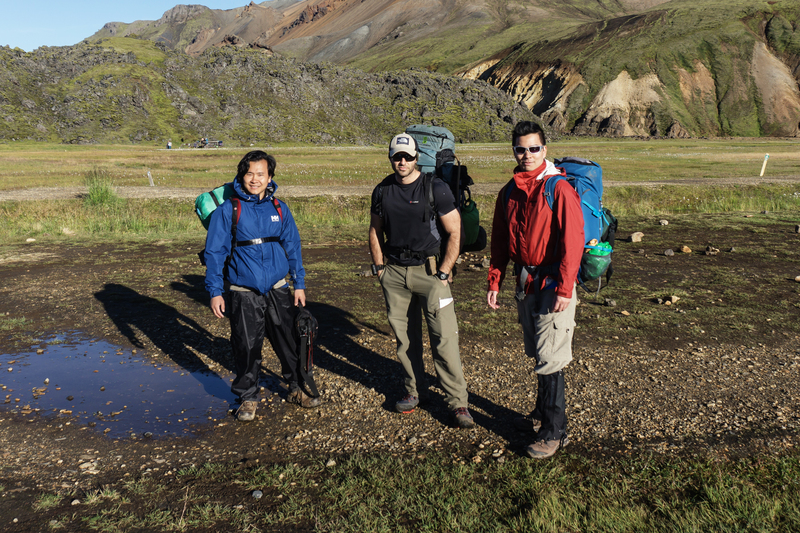 The advantages of trekking in a group are many – one of them is the ability to divide up the weight load, Linh and I carried around 16kg of food while Cristian carried the the large Denali Vortex 3-men tent. The tent itself can accommodate more than just 3 grown men but also had sufficient room for our 3 packs as well as room to move and miscellaneous items. I cannot stress the importance of a good, expensive tent. 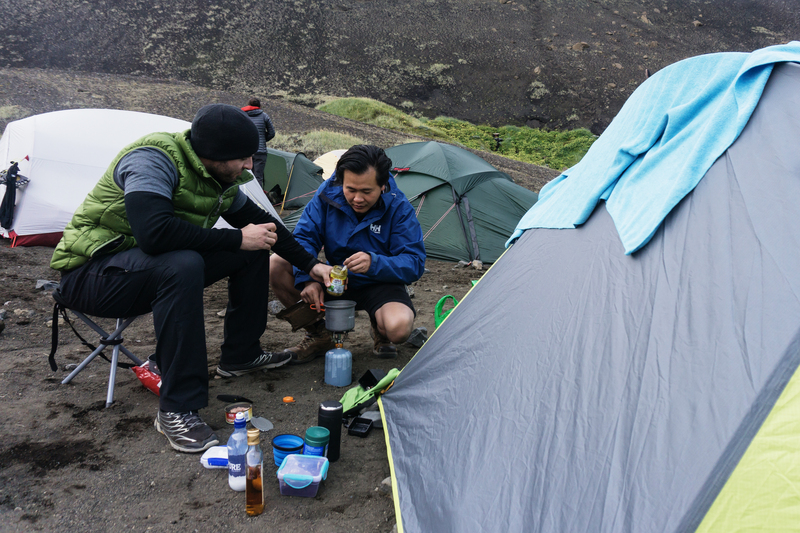 The Denali was fast to set up – less than 5 mins between 2 people – and very sturdy in the windy conditions of the Icelandic highlands; never cheap out on a tent when you are trekking, especially in unpredictable environments. 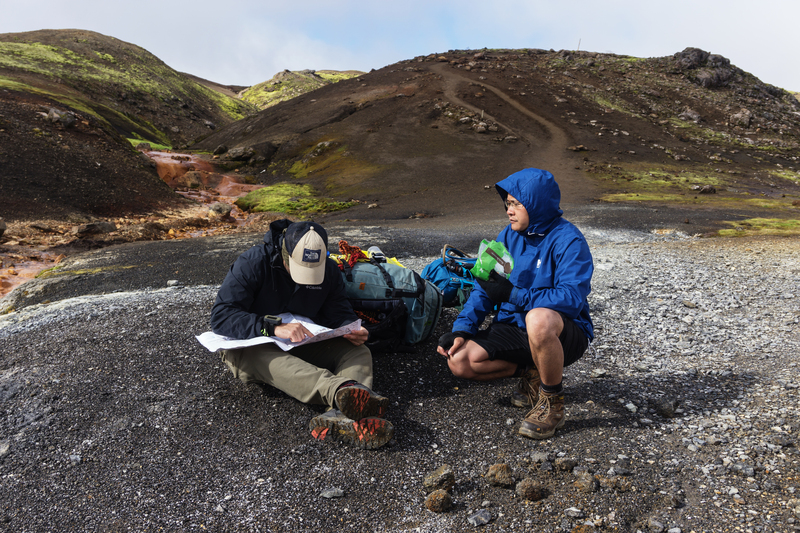 I also carried waterproof pants in the backpack, in case of heavy rain. Fortunately we did not encounter any adverse weather conditions, save for light snow near the glaciers at around 1000m in altitude. 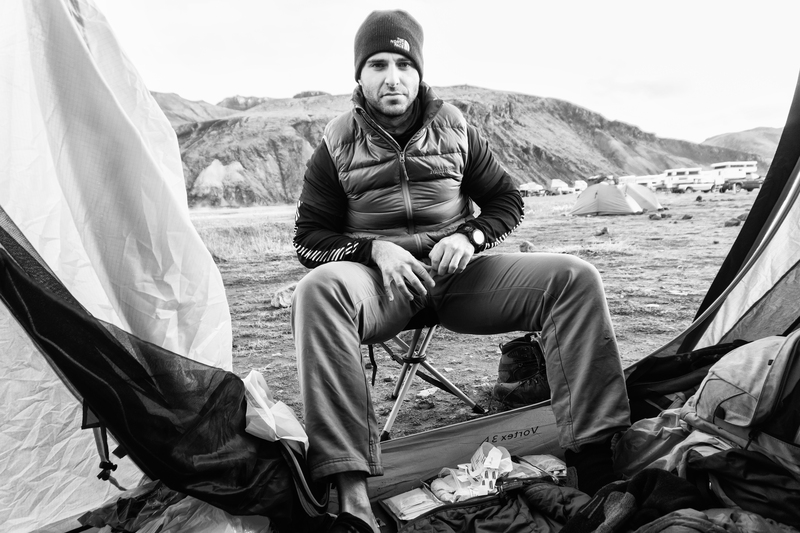 At nights I wore lightweight thermal long sleeve top and bottoms at around 160gsm thickness, with a lightweight sleeping bag rated to only 0 degrees. I had a warm and comfortable sleep on top of the Sea To Summit Ultra Light Insulated inflatable sleeping mat, with an R-value of 3.3, which is a good level of warmth even in sub-zero temperature. 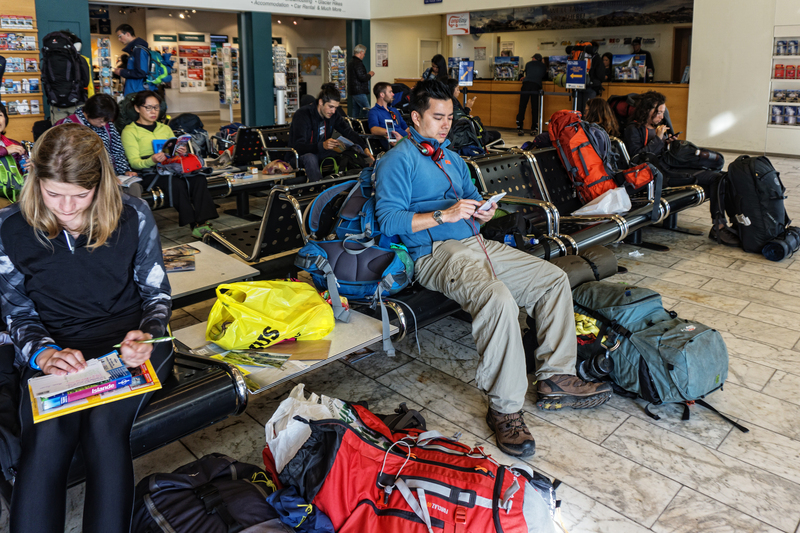 From the main BSI bus terminal in Reykjavik (which is operated by Reykjavik Excursions) I decided for the group to head for the trail-head and main campsite at Landmannalaugar a night early.This was so we could depart for the trek in the morning.–. 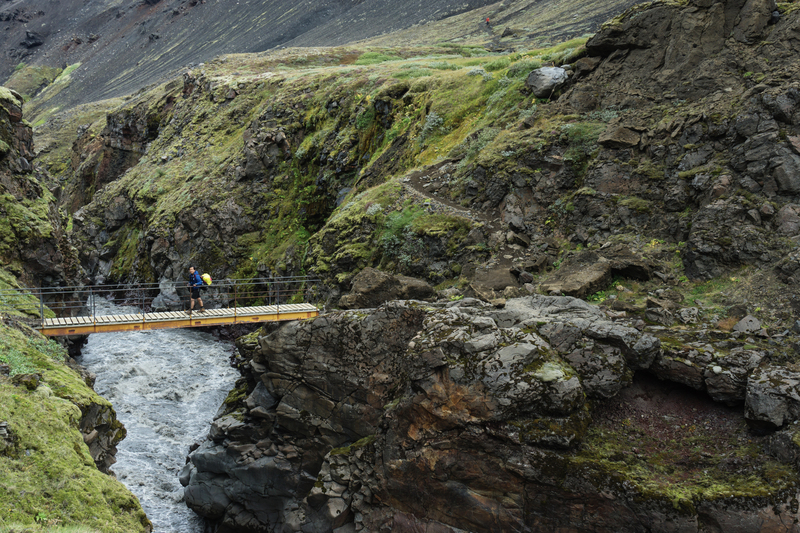 It was a 4-hour bus journey and encompassing a variety of stops by the tour guide to show us the diverse nature of the Icelandic countryside, with tales of their mythical mountain trolls of yore and history of this beautifully rugged land. 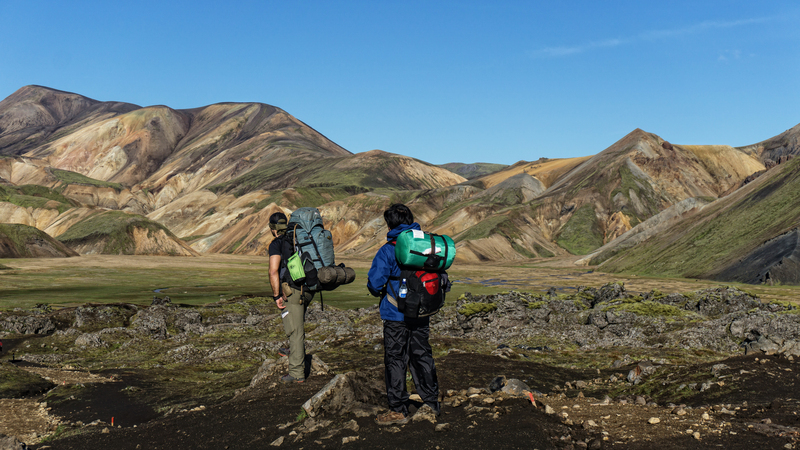 It was after 9PM when we arrived at Landmannalaugar – and it was tent city. 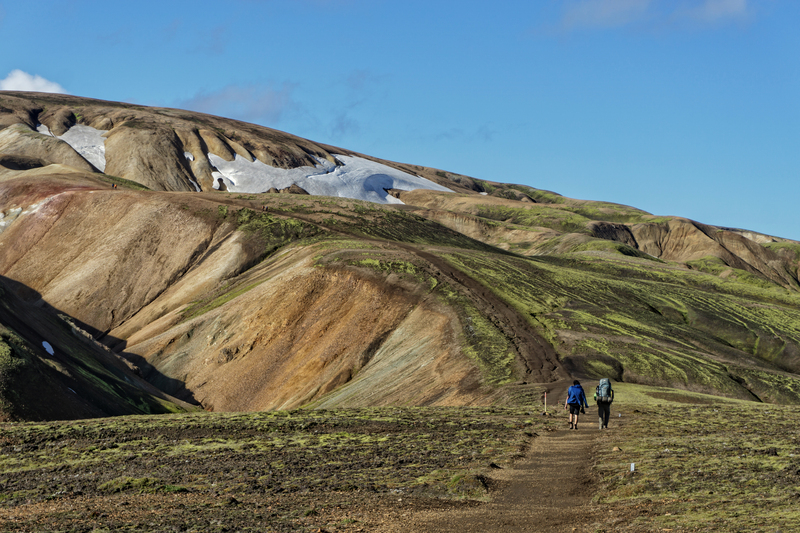 Some were overnight trekkers who came to explore the surrounding colourful hills and mountains and to enjoy the amazing natural hot springs, while most were starting out or at the end point of the Laugavegur trek. Being so close to the North Pole meant that we had sunlight till nearly 11PM and had sufficient light to erect the tent and settled in for the night. 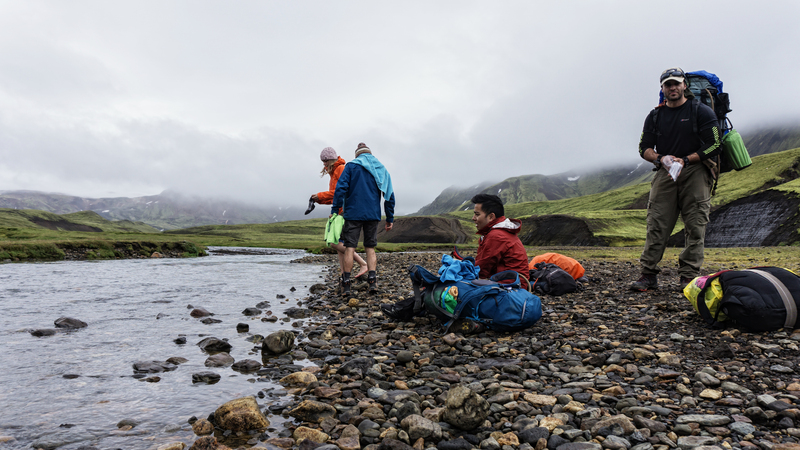 The main drawcard of the Landmannalaugar campsite is the large natural hot spring bubbling right next to the tents. 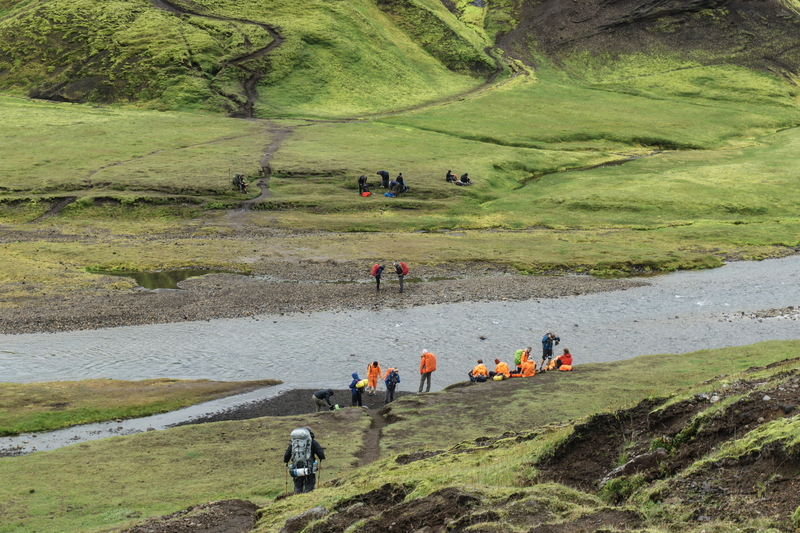 We joined the throngs of trekkers stripping down to our bathers in the dark outdoors in single digit temperature – and plunging into steaming hot water heated by volcanic vents. Stray too close to the steam and you could feel the painful rush of scolding water occasionally flashing past you on top of the already hot water. 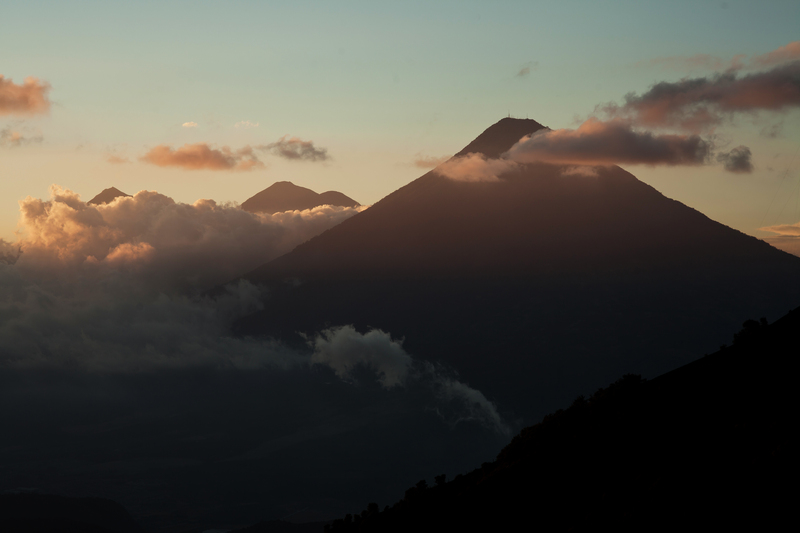 It was an incredible experience to lie there in the mountains in the dark and soothed by the healing power of nature. 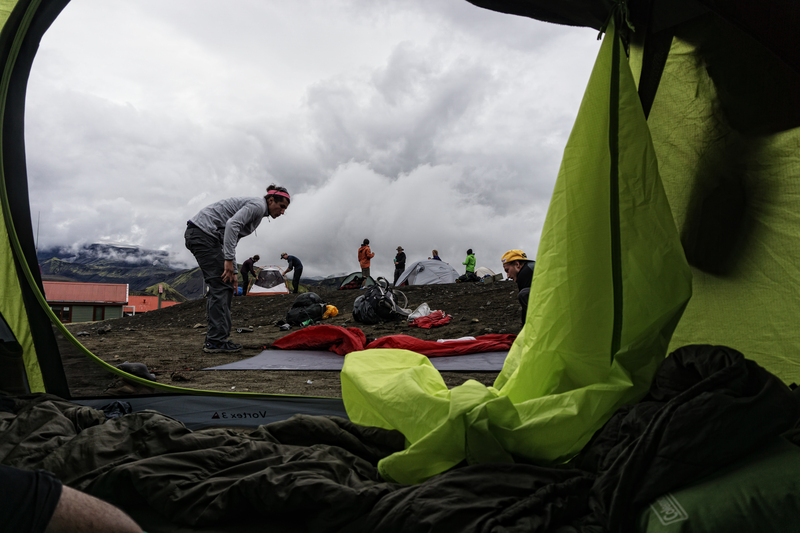 The next morning was a hustle and bustle of tents being collapsed, meals being cooked, a surprisingly modern unisex bathroom and showers building bursting with trekkers in their morning routines before departing. Just like that, we set off after 8AM, with early risers already seen walking in the distant hills. 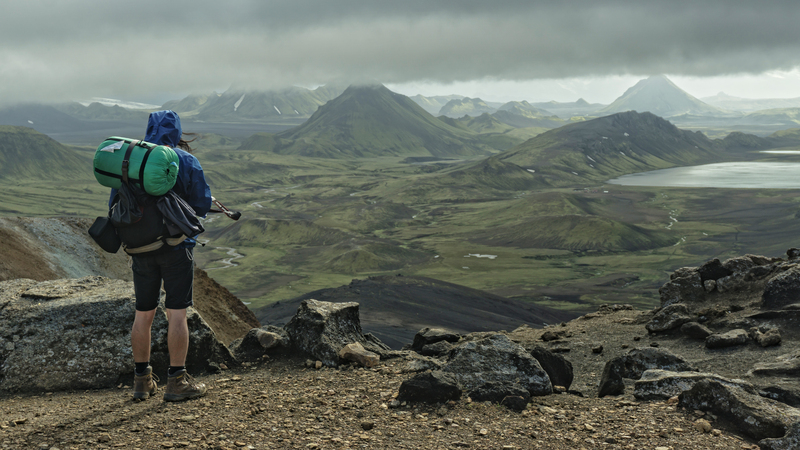 We knew this day would be a tough one, as we planned to reach all the way to Alftavatn before nightfall – involving a 25KM leg with a lot of hills to ascend and descend ahead. I won’t lie, it was a hard day; I consider myself to be of a good fitness and strength level, but a 25KM day up and down hills with a 20kg backpack is tiring for anyone. But the landscape –wow what a view that was throughout the whole day. Probably the best distraction from our muscle fatigue is evident every time we gaze around this ancient yet diverse landscape. 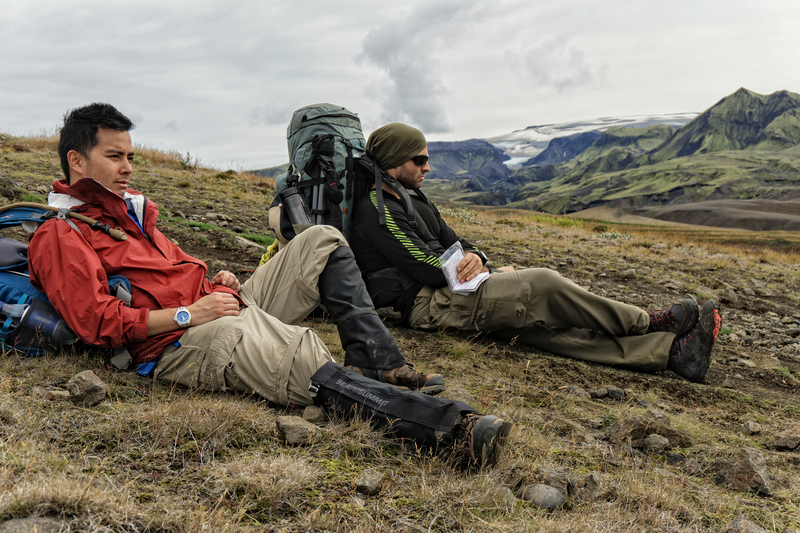 *One of the best and most helpful features of the Laugavegur trail is that you do not need to carry much water at all. As there are many freshwater streams criss-crossing the whole trail and one is never far from any water source. It was one of the best freshwater I had ever tasted as well. 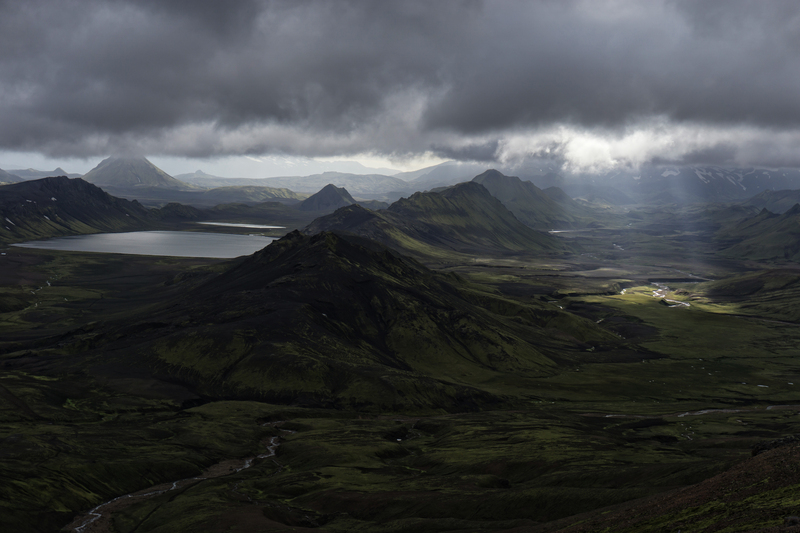 The most spectacular view and the hardest part of DAY 1 was the steep and long descent to Alftavatn Lake from the mountainside. It was an hour or so of steep, knee-jarring descent. 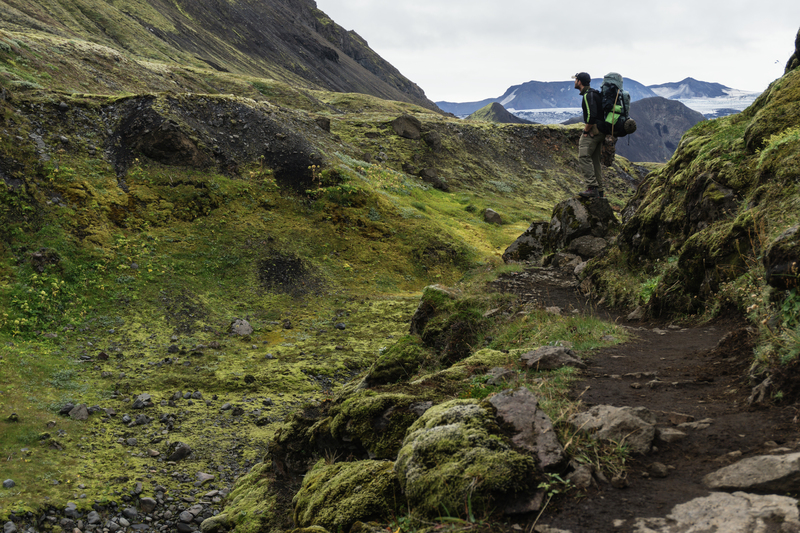 For anyone with weak knees, it is advisable to carry walking poles to assist you on the way down to take the strain of the knees and reduce the danger of falling over. *I have seen a lot of incredible landscapes around the world over the years, but this had to be one of the most memorable of all. It reminded me of the cartoon ‘A Land Before Time’. We stopped here for a while to simply take in the natural beauty. 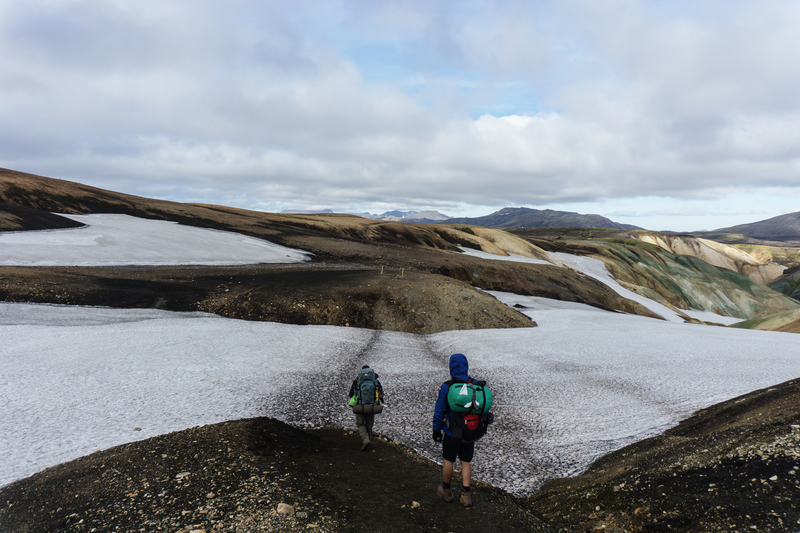 PERSONAL ADVICE: One of the reasons we walked 25KM instead of the usual 12KM on the first day, was that we wanted to skip the main checkpoint and cabin at Hrafntinnusker – the halfway point between Landmannalaugar and Alftavatn. From reading trekking diaries of those that had accomplished the trek and my own research, I believe it was the correct and excellent choice to skip spending the night here. 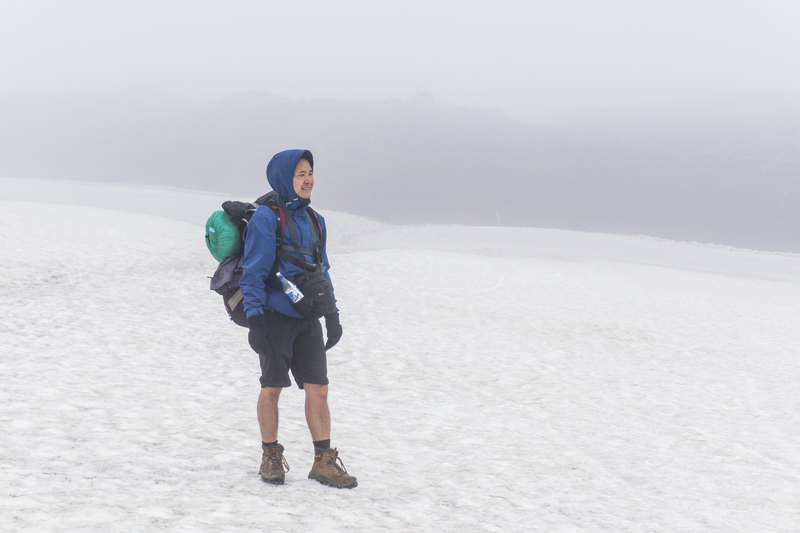 The main cabin and campsite lies at an elevation around 1000m in altitude, and was extremely foggy with a very high wind chill factor. 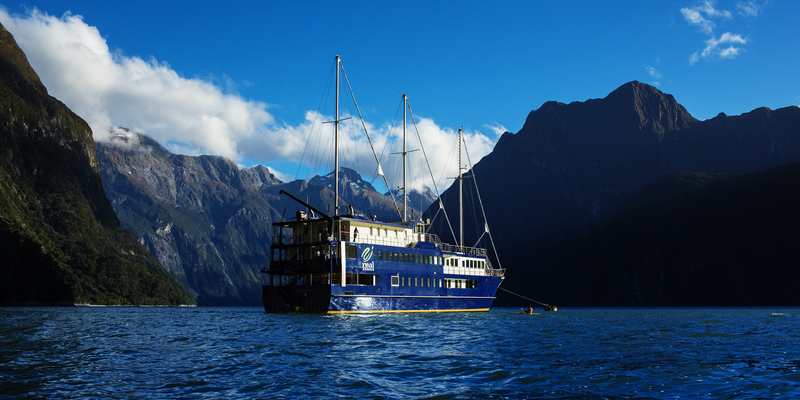 Its close proximity to the snowfields and glacier made for a very cold lunch stop. 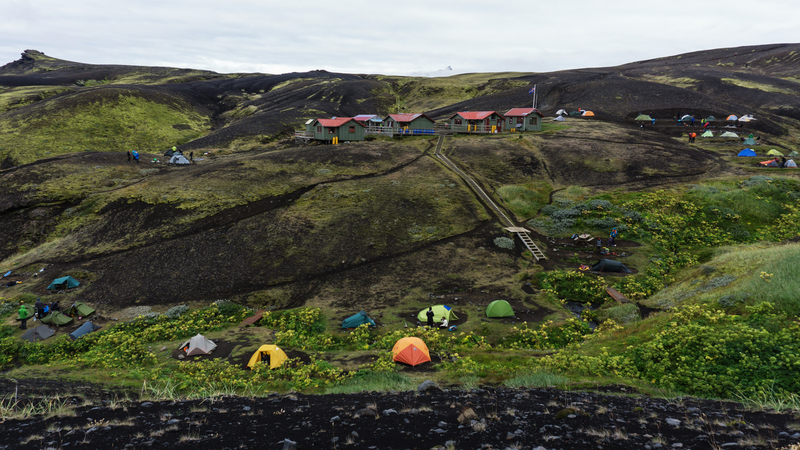 I personally think this is not a great place to set up camp for the night and would recommend anyone to keep pushing the extra 12KM to Alftavatn Lake at an elevation of 565m and much calmer weather. Today was a much easier day, albeit with some sore limbs and shoulders. 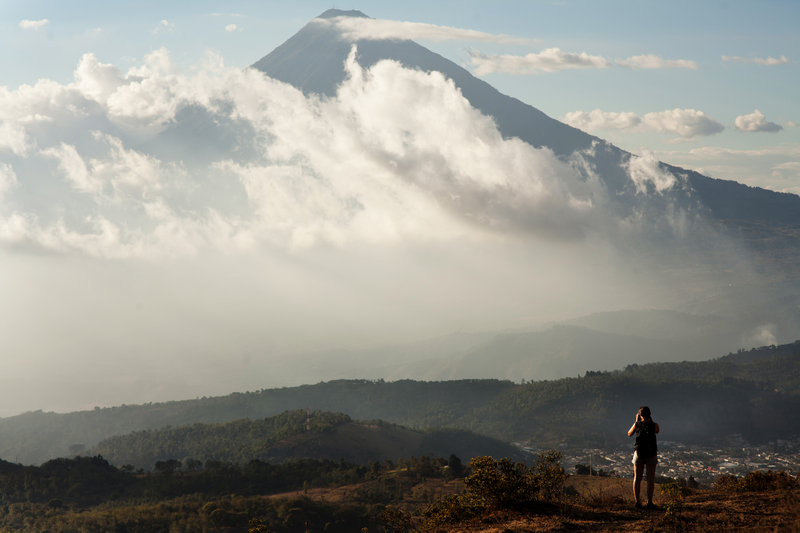 The landscape had shifted dramatically with the majority of the 15KM leg of the second day spent walking through black sands and huge calderas of ancient volcanoes from prehistoric times. 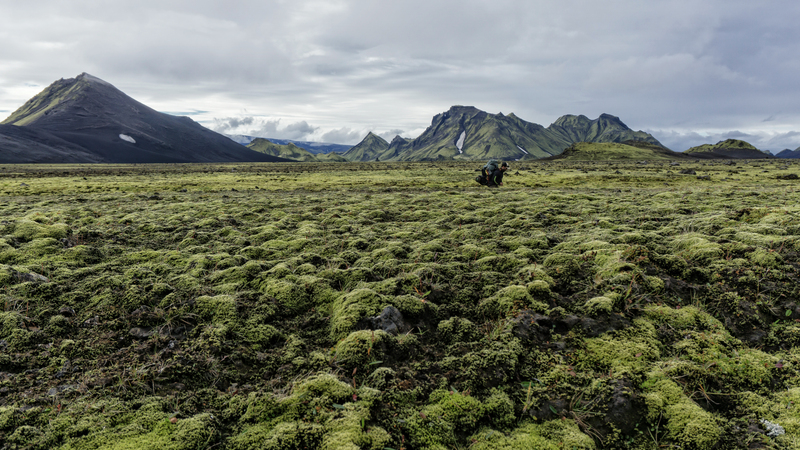 We regretted not staying in Alftavatn for another night as it was a very picturesque campsite by the lake and surrounded by moss covered hills and volcanic craters. Near the end of the day we encountered the second river crossing and most significant one yet. 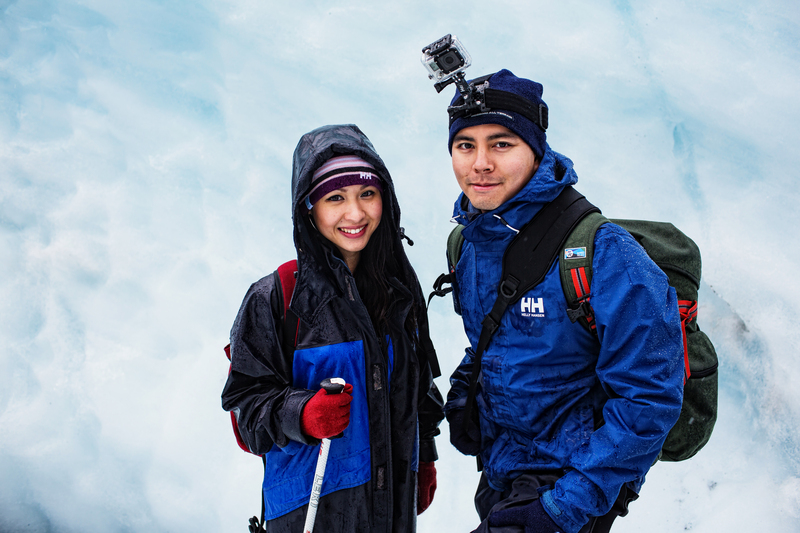 With a strong current and knee-deep water level on that day, the melted glacial water was one of the most painful experiences I had encountered. I highly recommend using walking poles for support, or have a buddy system to hold onto each other for support whilst crossing. The last day of the trek, our main focus was to reach Thorsmork campsite to catch the large 4WD bus back to Reyjavik at 1530.Another day, another shift in landscape and weather – right after leaving the campsite, we encountered a steep descent down a hillside covered in loose volcanic ash, proceeded by a beautiful crossing of a deep gorge with fixed rope to aid the descent. 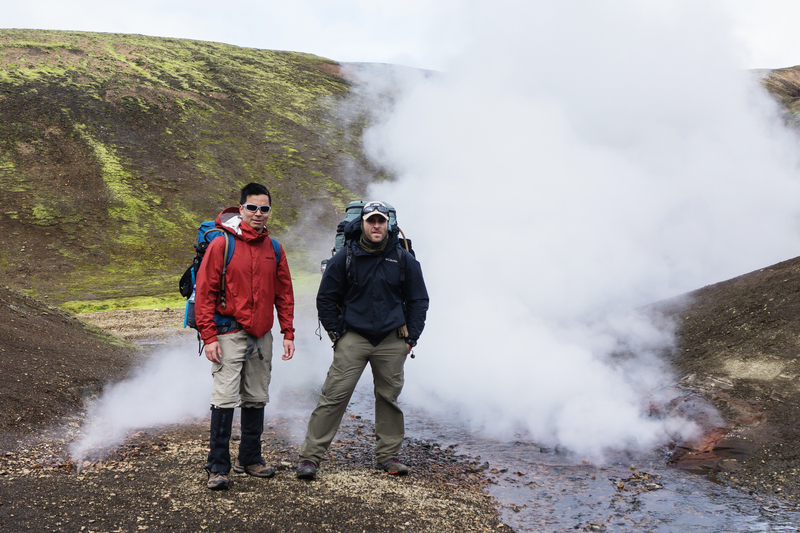 One could really feel the temperature warming up, as we are descending lower and lower to our final campsite. I knew that we would eventually encounter our final river crossing, but I did not anticipate how wide the Pronga River was – which eventuated into 5 smaller crossings to get to the other side of the bank. 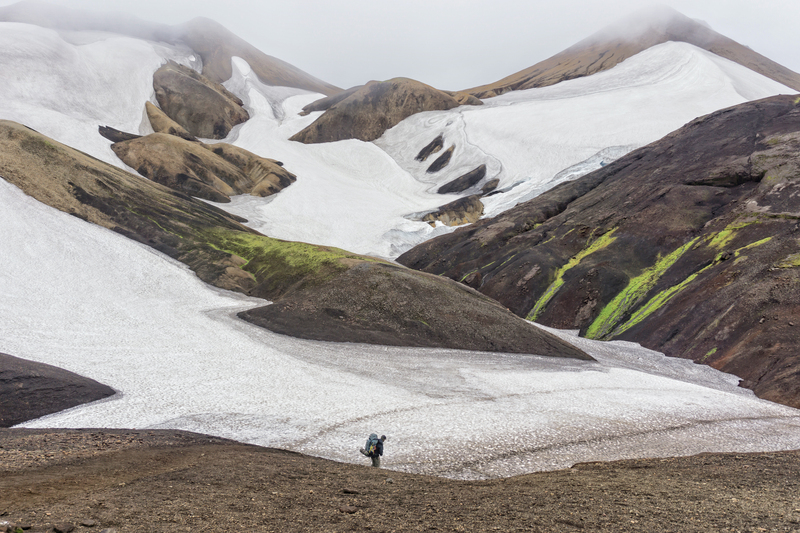 It was a surreal experience; the last few kilometres of the trek were through lush green forests before seeing the huts at Thorsmork, ringed by tall hills and glaciers in the distance. We made it, in roughly 2.5 days of trekking, even though the recommended duration is around 4 days for many people. Looking back, the three of us sincerely believed that was one of the most unique treks and landscapes we have witnessed and traversed. 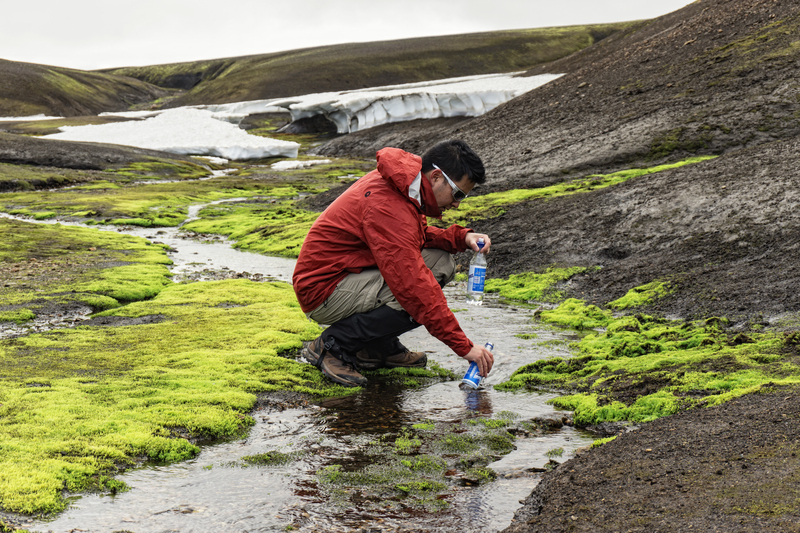 There was nothing else like what we saw on Earth – from prehistoric landscapes to witnessing the collision of fire and ice, to the stark and desolate beauty of ash-covered calderas. We would do it again, but for longer, to truly take in this unique place in the world. 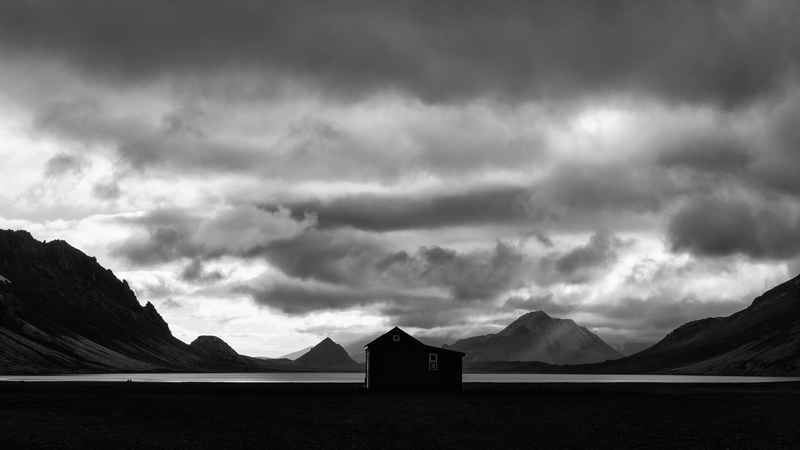 I had seen different friends on social media visiting Iceland in the last few months, their photos are beautiful, but they are all the same. 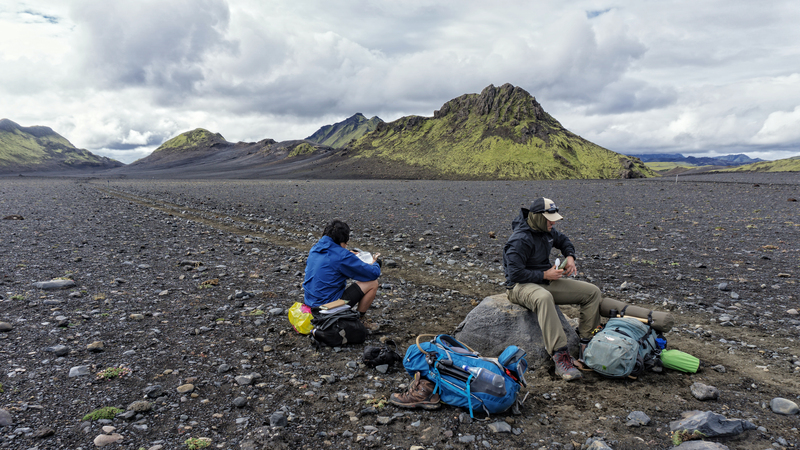 Road trips and day trips around Iceland and the coastlines are stunning, but it does not offer the type of diversity as what we had witnessed on our trek. 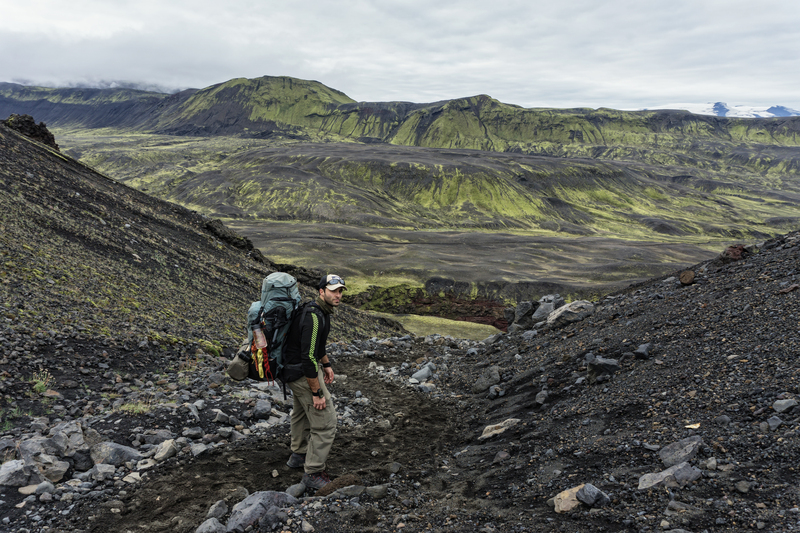 To us, and to the locals that have walked the trail – that is the real Iceland, a place of abrupt changes in diversity, of fire and ice and of desolate features that had to be seen and experienced with one’s eyes. 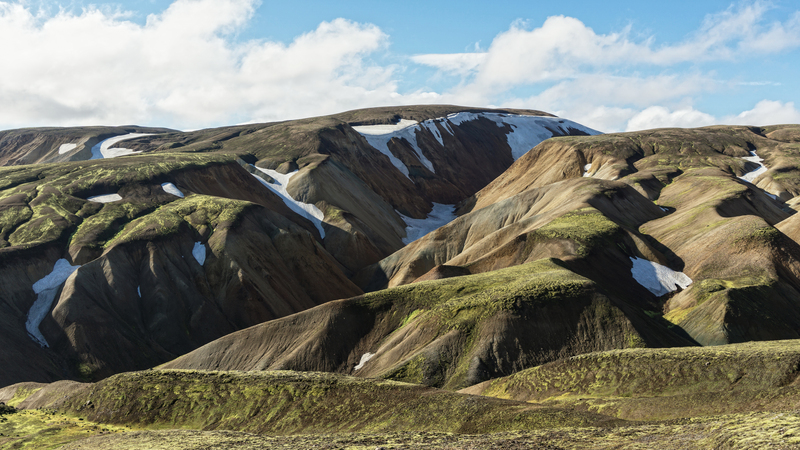 You really have to visit the interior of Iceland to see the real country, the highlands is where its true beauty lies. Follow me on Instagram at @jackietranphotography. or my Facebook work page – Jackie TRAN. I have seen a lot of Australia, more so than the average Australian. From crossing the Nullabor, to the beautiful alpine regions of Victoria and New South Wales, to the Top End, to remote towns in the middle of nowhere or along desolate coastlines away from the tourist trail. But far north Queensland took me by surprise, and it was a wonderful experience. 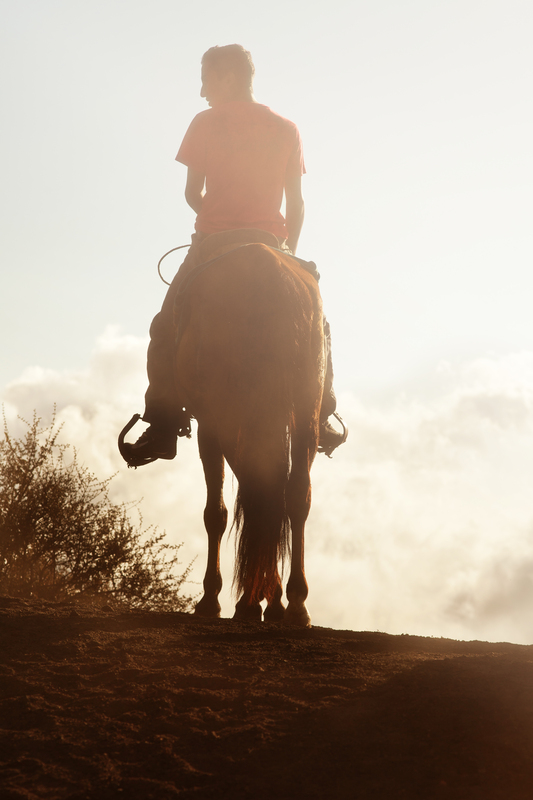 Many see Cairns and Port Douglas as the last major city and town in northern Queensland, before it becomes wild, uninhabited country that is only frequented by big 4WD vehicles that are prepared for extended trips. Although Cooktown is a sizeable town five hours north of Cairns – but by then it is beyond the reach of most tourists. We heard great things only three hours north of Cairns and intended to find out, without having to venture too far off the beaten track. To the place called Cape Tribulation, just past the world famous Daintree rainforests – the oldest tropical rainforest in the world and a UNESCO World Heritage site. 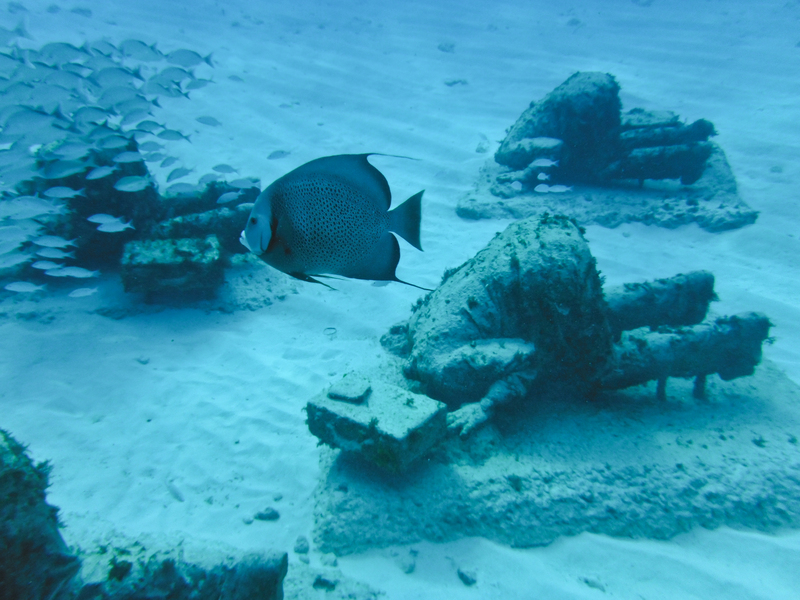 For this trip I had a Sony NEX5N in an underwater housing, rated down to 40M depth – it was only $100AUD on Ebay, and had served me well in a few countries from scuba diving and snorkelling trips. 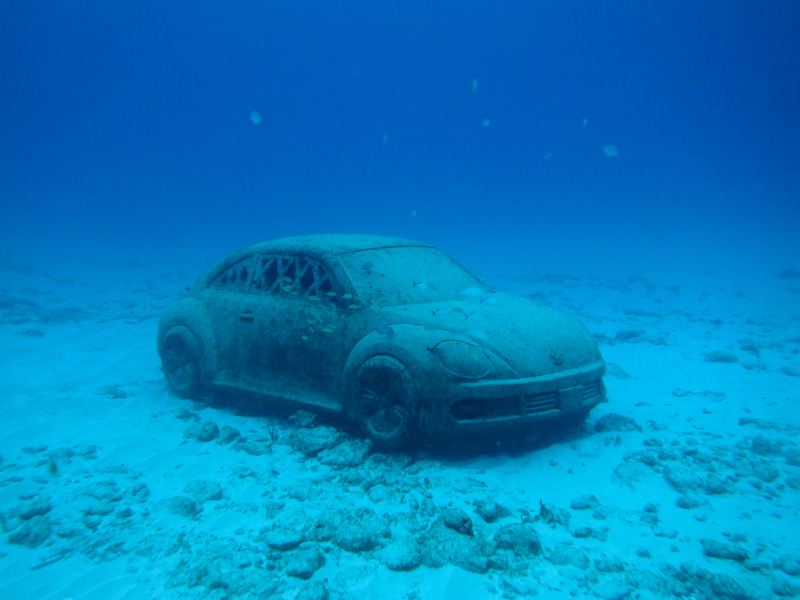 The lack of an external strobe light meant that using natural light or the small onboard flash was usable at up to 15M depth at good visibility. 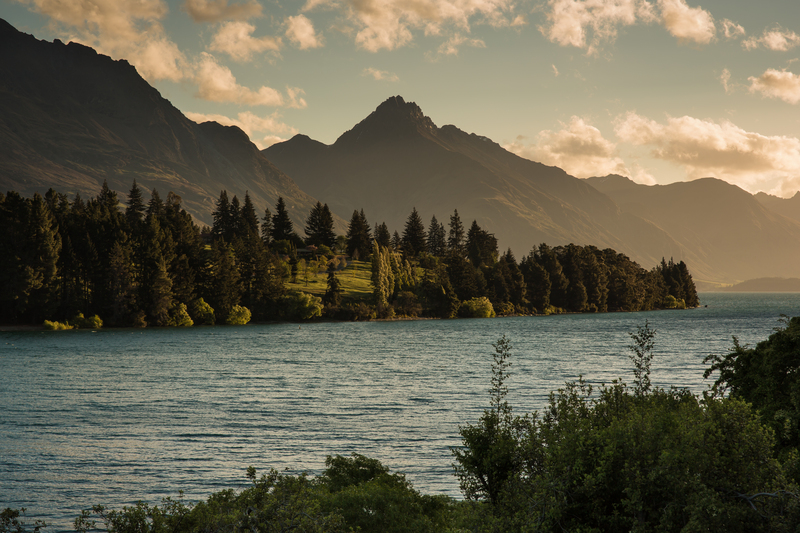 I also had no red filter as well so it made the post processing more challenging altogether. 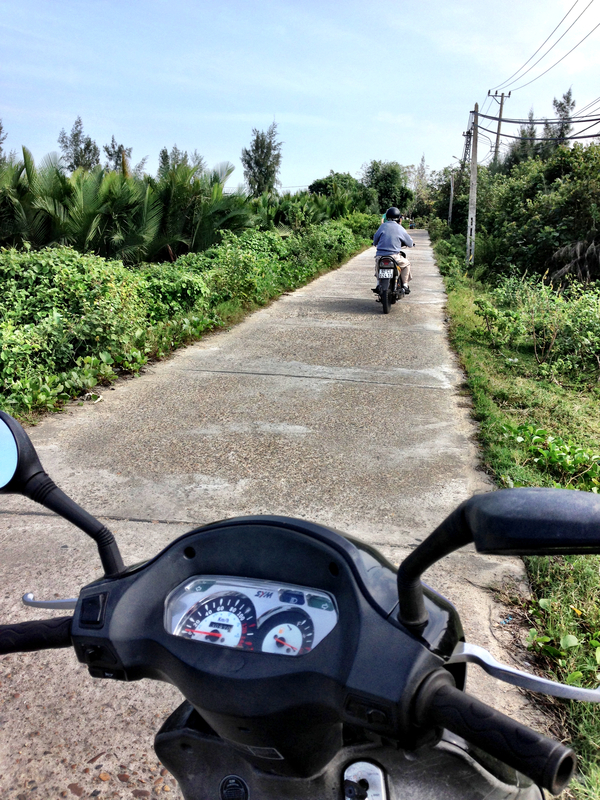 I felt like I was in South-East Asia. The air was humid and muggy, the constant noise and sound from the rainforest mixed with the faint salt smell and crash of the waves. I was able to witness something that is incredibly rare on Earth – a rainforest reaching out to touch beautiful white beaches – a rare sight anywhere in the world. This was not the Australia that I thought I knew, the lush green landscape made everything even more beautiful. Our rental Mitsubishi Outlander performed satisfactorily as expected on the unsealed roads around the Daintree and Cape Tribulation. The occasional deep ruts and potholes were of no concern to the raised height of the vehicle, compared to a normal sedan. I would recommend to any tourists spending a few days exploring this part of Australia to rent something of this calibre, or even better such as a proper 4WD vehicle, especially if you are carrying a heavy load or passengers. Back in Cairns and out on a scuba dive at Hastings Reef, I saw first-hand the effects of coral bleaching on the Great Barrier Reef, and it was a sad sight to behold. 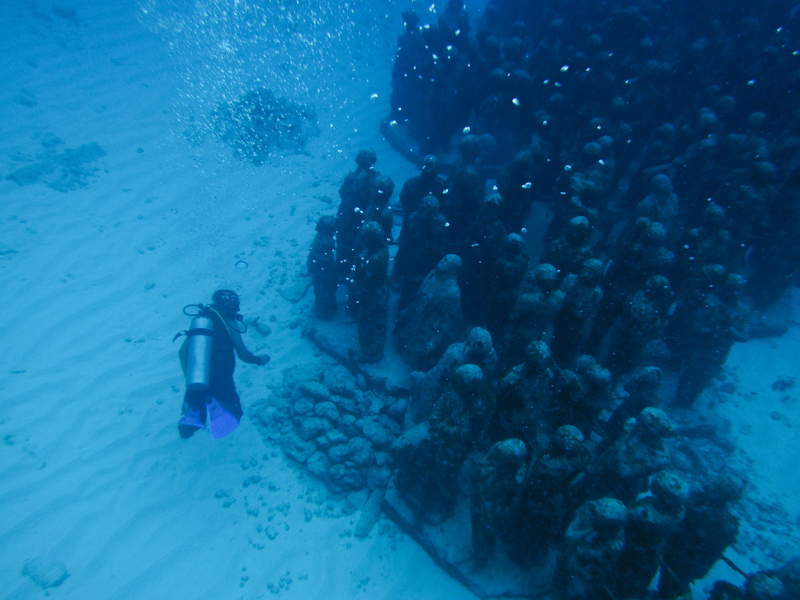 The last time I had dived at a big reef system was in Vanuatu at Hideaway Island – the colours and aquatic life with its mesmerising colours and abundance of marine life, where I literally had to brush fish away in front of me just so I can follow my dive instructor – was an unforgettable memory. It is without a doubt The Great Barrier Reef is suffering from coral bleaching, up to 93% of reefs surveyed by the Marine Park Authority in fact, this is an alarming figure. Nowhere did I see the colourful corals and marine life below as I expected from photos and videos – this is supposed to be our world famous reef – yet it is slowly dying in many parts. This is not a political article, so I do not want to get into intimate details about petitioning our government to do more to reduce the rate of coral bleaching and countermeasures. 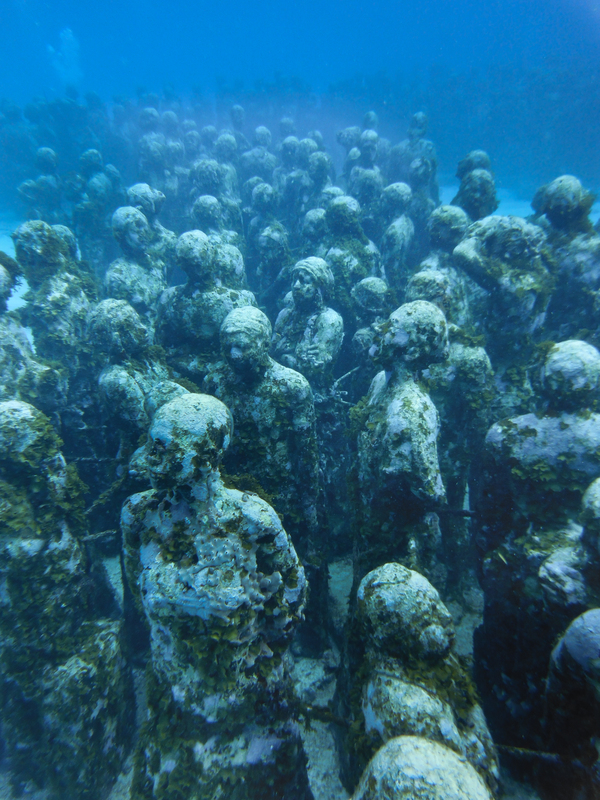 All I can say is – visit the beautiful reefs before it may be too late. Portraits, something so simple yet sometimes so hard to achieve without looking staged or set up. 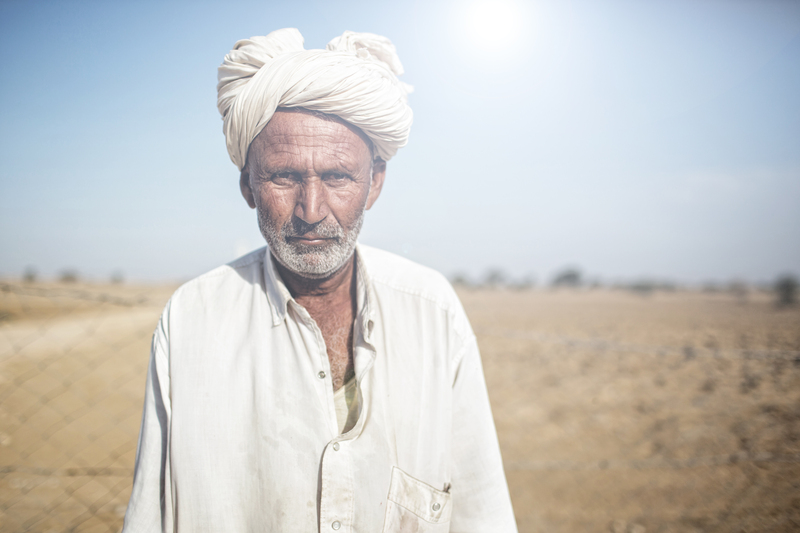 My love for travel photography centres around ‘environmental portraiture’ – where I am able to capture not only the faces and expressions of my subject, but their surroundings and environment as well. 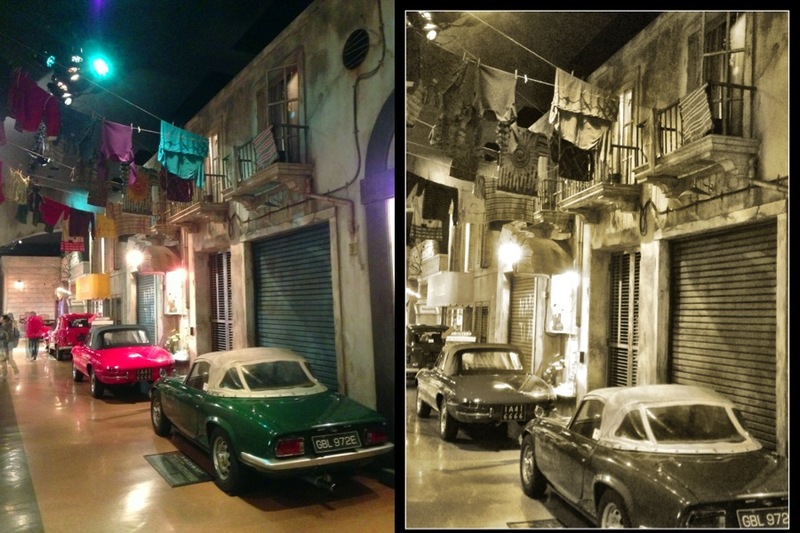 This allows the viewer to better engage with the photo, and to understand and feel how the subject lives and exist. My go to lens is the Canon 35L on an FF body, allowing me to have a wide enough photo yet still maintain a high degree of depth of field. 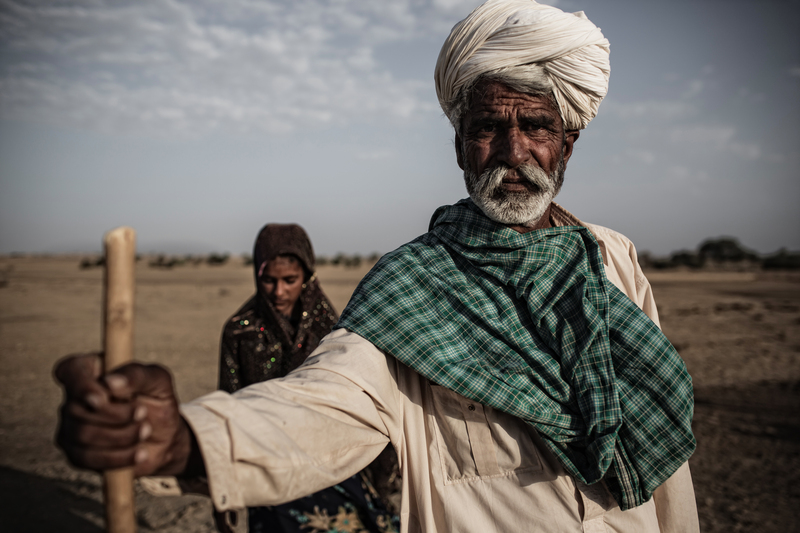 Near the border and buffer zone between India and Pakistan, in the Thar desert region near Jaisalmer – I spotted an old goat herder. I asked to take a photo of him and he proudly posed for my camera, yet at the same time was quite protective of the girl behind him. His body language indicated that he did not want her to be captured at all. So I thanked him and walked back to the camp site. 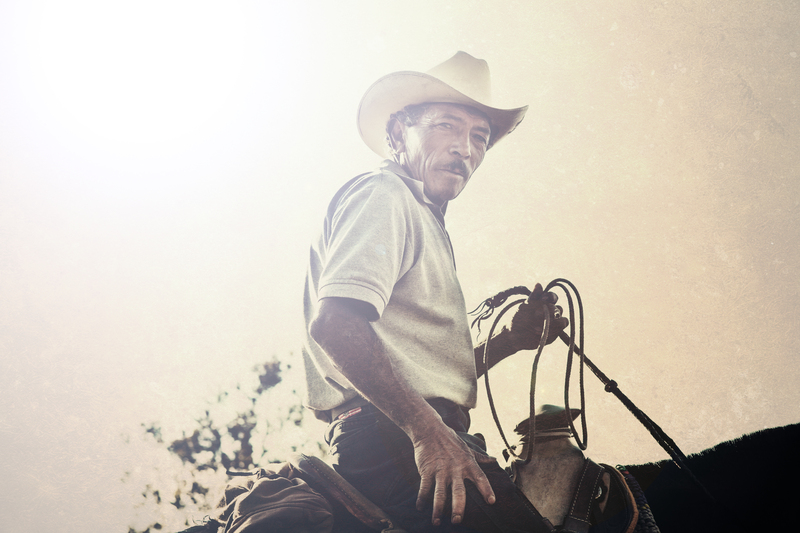 A handsome local who rode up to our campsite to sell soft-drinks with his young son. A photo and scene that will stick in my mind for a long time. 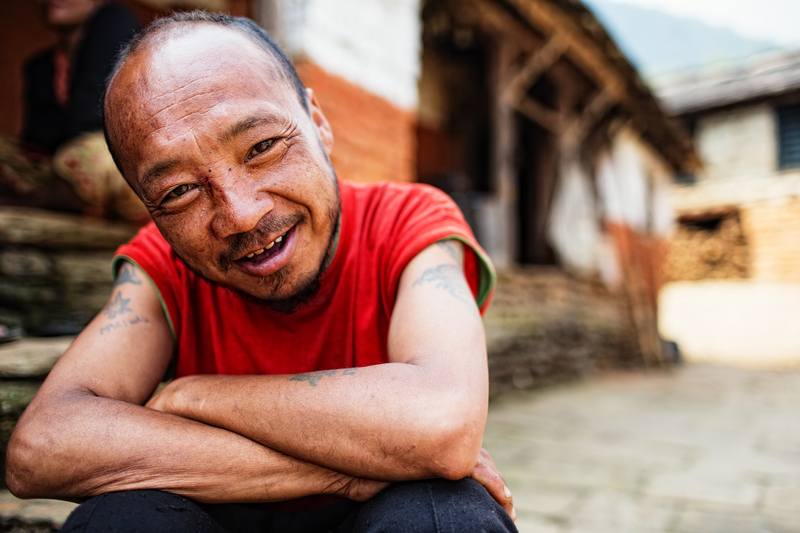 During our trek in the Annapurna foothills, a local village boy ran up to us and constantly begged for chocolates. Unfortunately we did not have any to give to him. 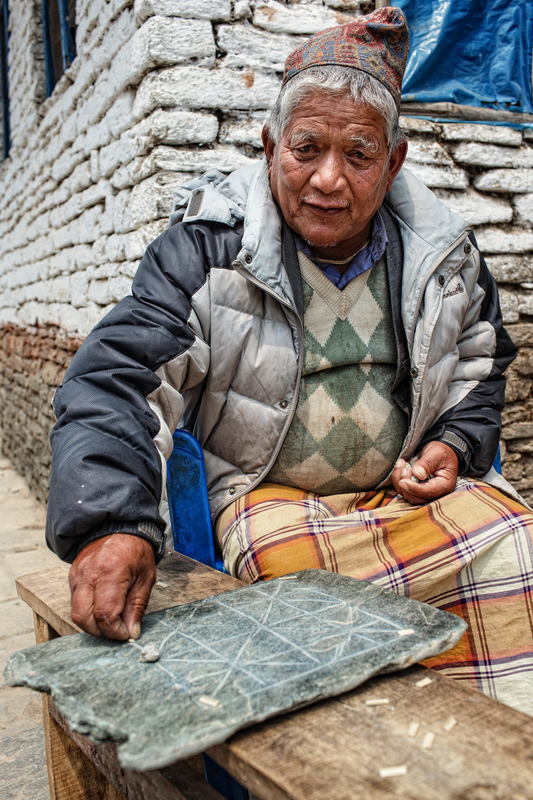 Such luxury goods are highly prized by villagers in remote areas. 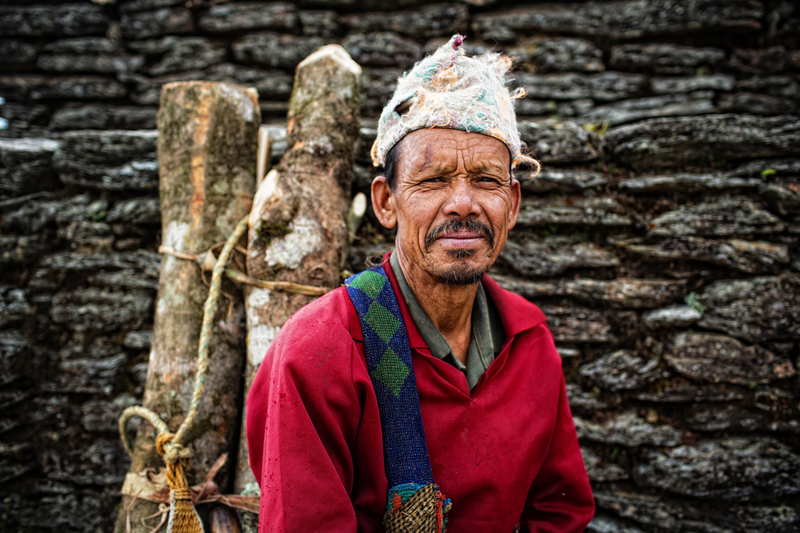 You dont realize how fit locals are living in the mountainous terrains, until you see them carrying heavy loads on their backs – while smiling at you without breaking a sweat, up and down the steep trails. 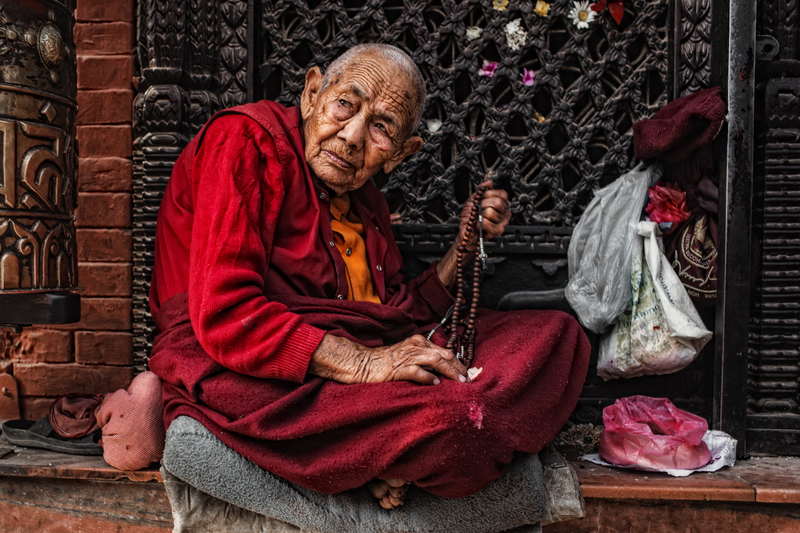 The Boudha Stupa in Kathmandu is a place of significant religious value, but open to tourists, monks and those practicing yoga from all over the world. An elderly monk was praying and seeking alms as I took a photo of him. Durbar Square in Kathmandu in the afternoons is the place to be for many locals. 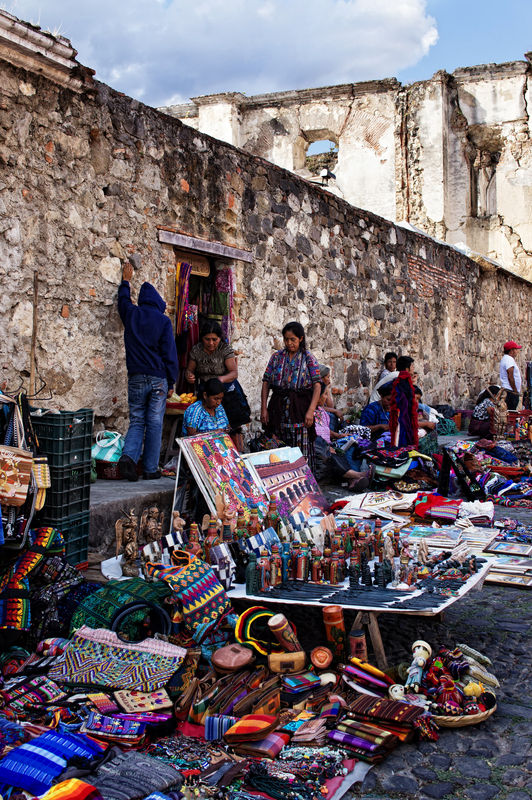 The destination to meet up with friends, buy produce from market stalls, or to simply sit back and soak in the atmosphere and people watch – particularly wide-eyed tourists who had just arrived in the country. 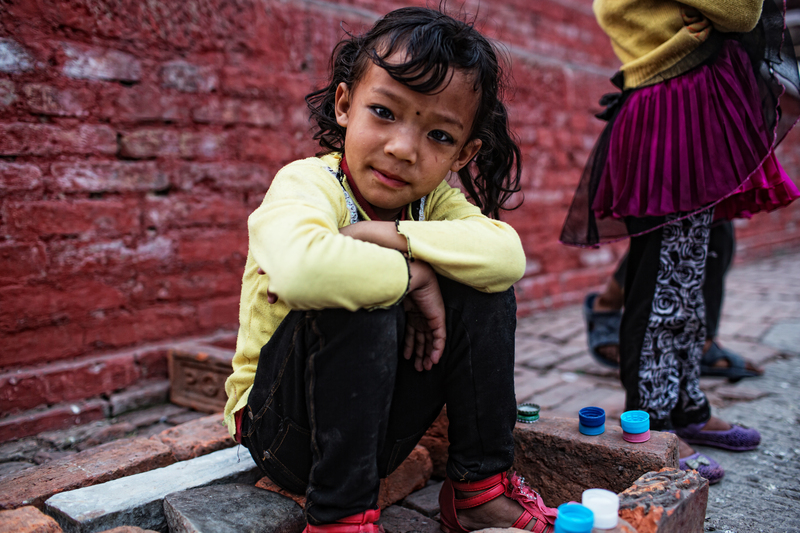 This little girl was playing by herself using rocks and bottle caps. 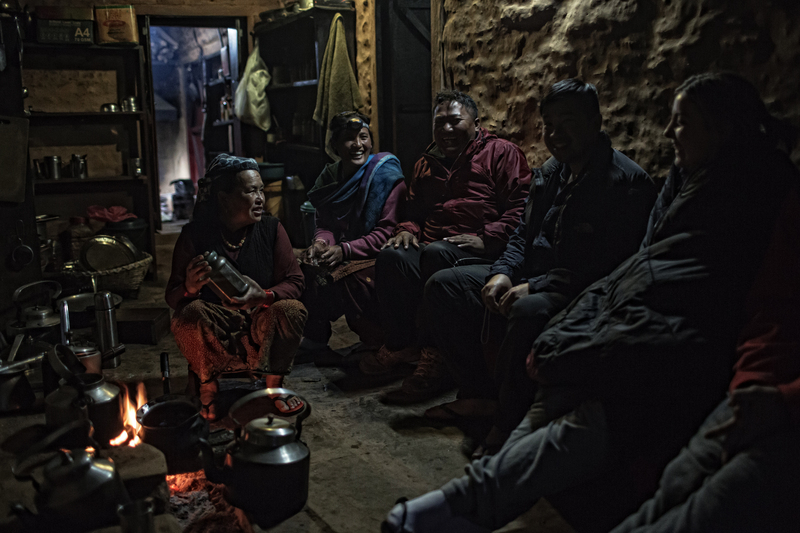 A drunken villager who was celebrating with his family when we came by for a break from the descent from the mountains. 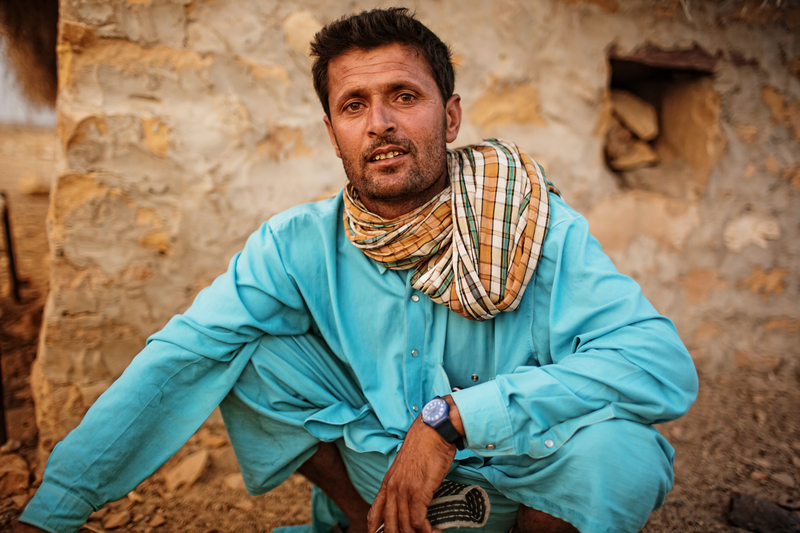 Tourism in the Rajasthan region of India is still growing strongly, with many resorts and hotels being built in the Thar desert, this was one of the workers at a resort site I came across. The young boy who accompanied his dad on his own camel, coming by to sell us soft drinks in the desert. 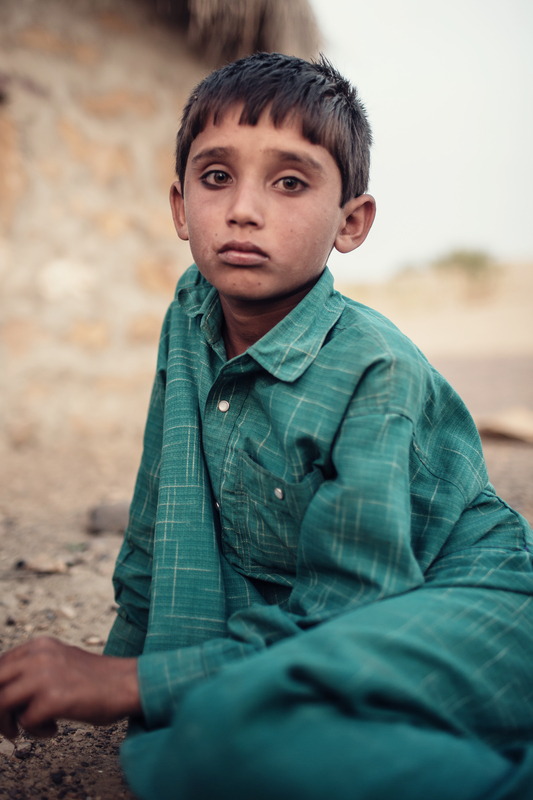 A shy boy who hid behind other boys and young men, when we came to visit their village outside of Jaisalmer. 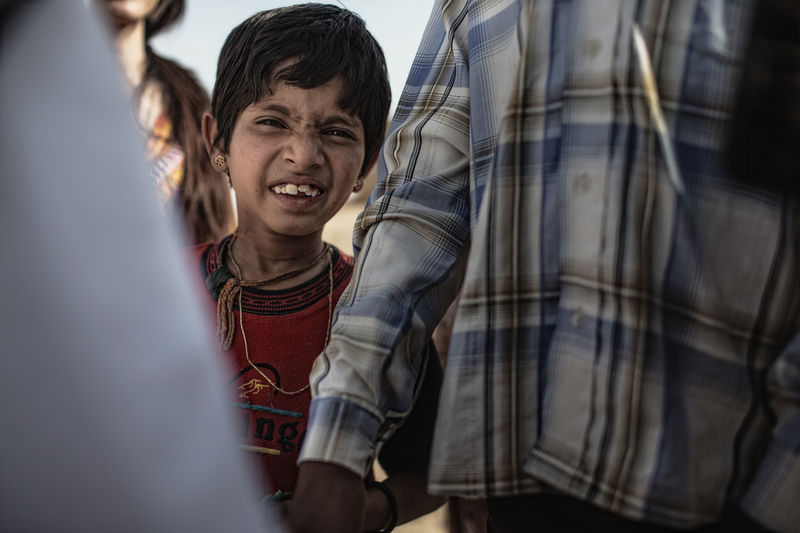 At the Epitaphs outside of Jaisalmer, local school boys came up to us out of curiosity and kept asking us for one thing, which we couldnt understand. It was not till a while after that we found out they were asking for pens and pencils….. He was trying to explain to me the rules of this game, naturally our language barrier prevented me from understanding much. But from the time spent with him – it seemed very similar in ways to Chinese chess. The morning after. Our guide cooking breakfast for us, before a herd of goats invaded the campsite and tried to steal food. The name Chomolungma, or Sagamartha depending on which side of the Himalayas you are coming from; has resonated strongly with avid travelers like myself for years. 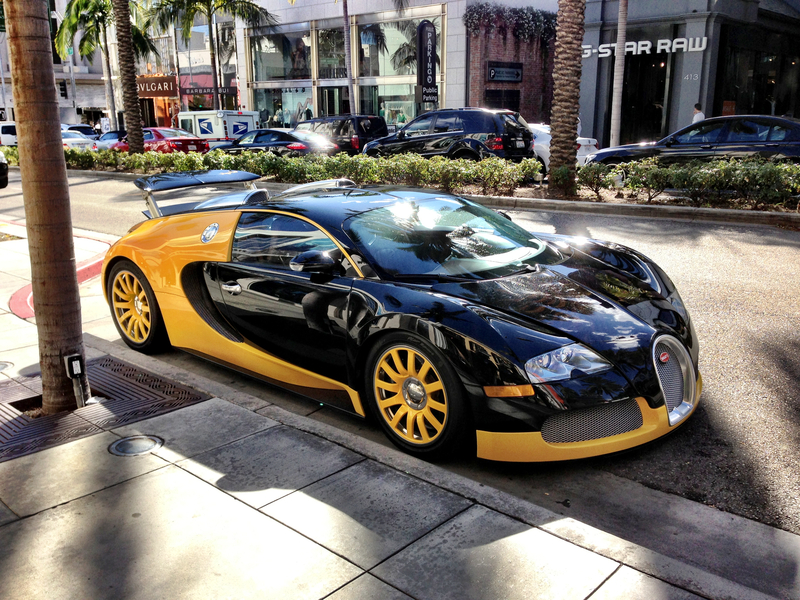 Many yearn to climb her but only a few lucky ones will ever succeed. While many are simply content to stand in her shadows and see with their own eyes. Maybe one day I will attempt to summit the peak, but for now I was just happy to be in the same country as Mount Everest! 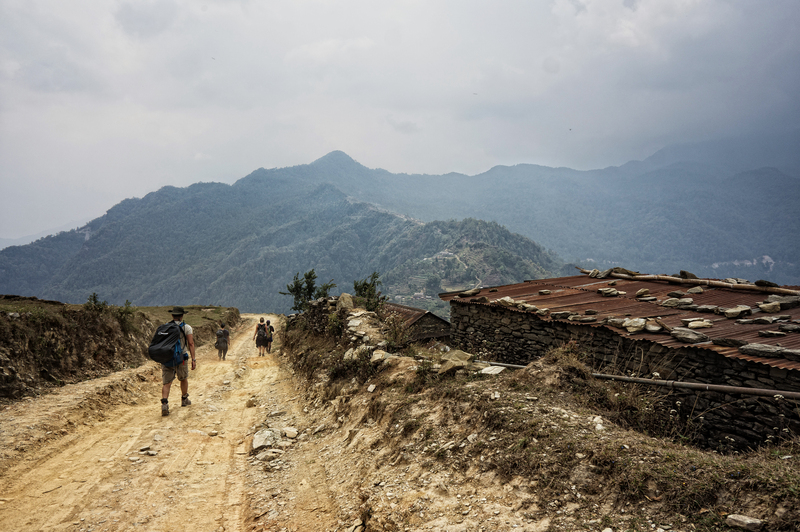 The main objective of my first ever visit to Nepal was to get a taste of what to expect for future hiking trips in the region. 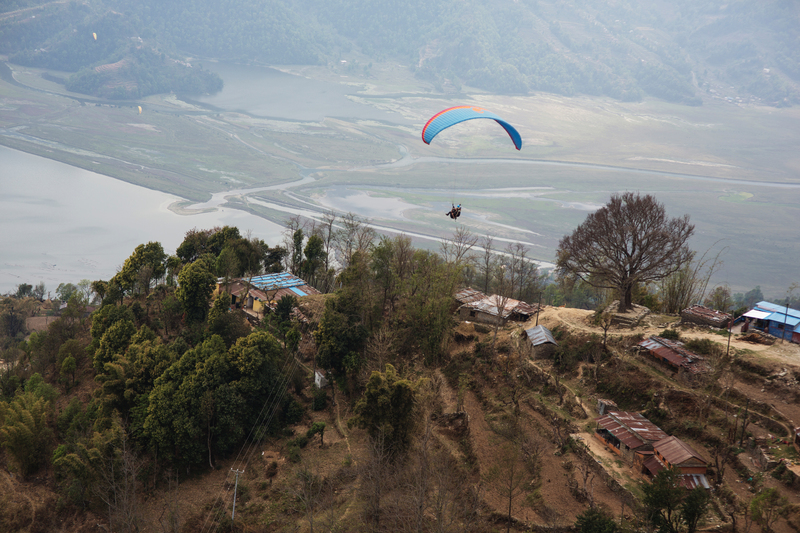 Due to our limited time in the country I opted for the Annapurna range via Pokhara upon hearing of its serene beauty – of both the town and the surrounding hills and mountains. 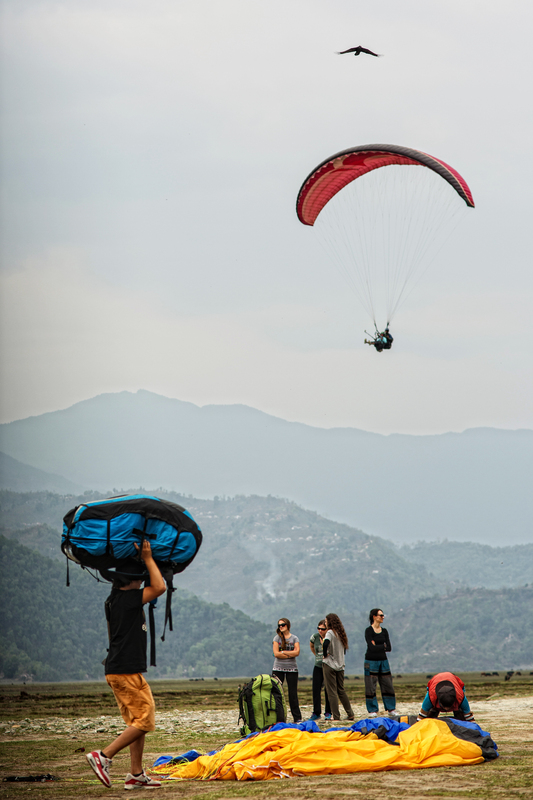 With the first few days in Kathmandu for sightseeing and trying out different variations of the local delicacy ‘momo’ (fried dumplings) – we took the well worn 6 hour car ride to Pokhara. This was a love it or hate it type of country. I loved it, but some of my friends didn’t. Our gruelling and tight schedule did not help either. 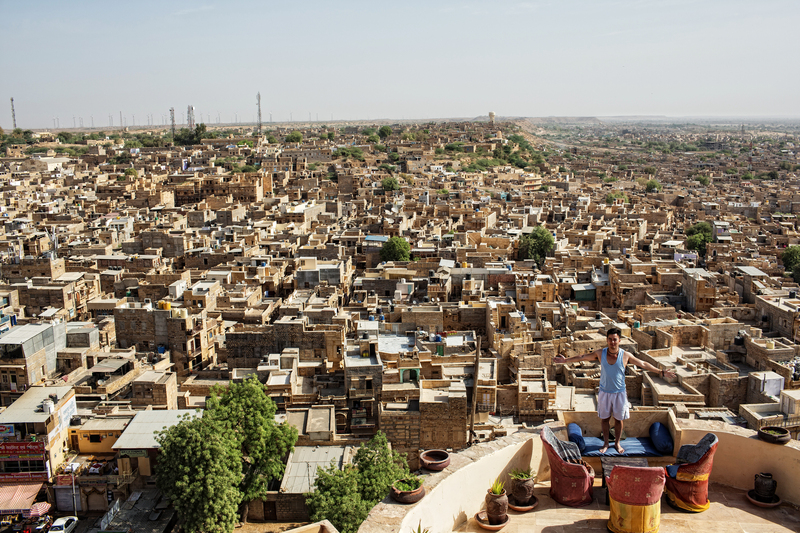 For many years I had dreamt about visiting Jaisalmer and staying in the fort in the desert, and was adamant we had to get there somehow. 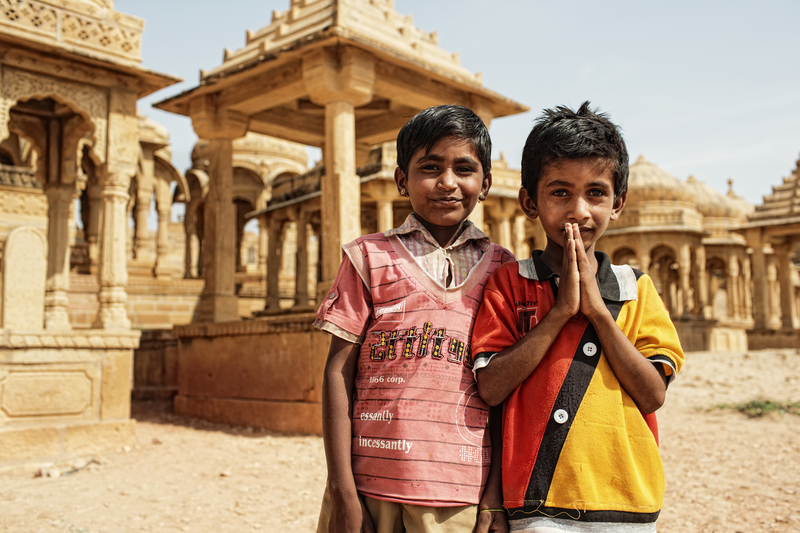 From Delhi to Agra to see the Taj Mahal, then to Jaipur, Jodhpur and finally Jaisalmer – everyday was roughly 6-7 hours in the car traveling to the next city. This was the most cost effective way with the short amount of time we had, as last minute trains and flights did not match to what we needed. The colours, my gosh the colours of the Rajasthan region was breathtaking! You see it on television but to see it in person or through the camera lens was like looking through a kaleidoscope of vivid scenes. 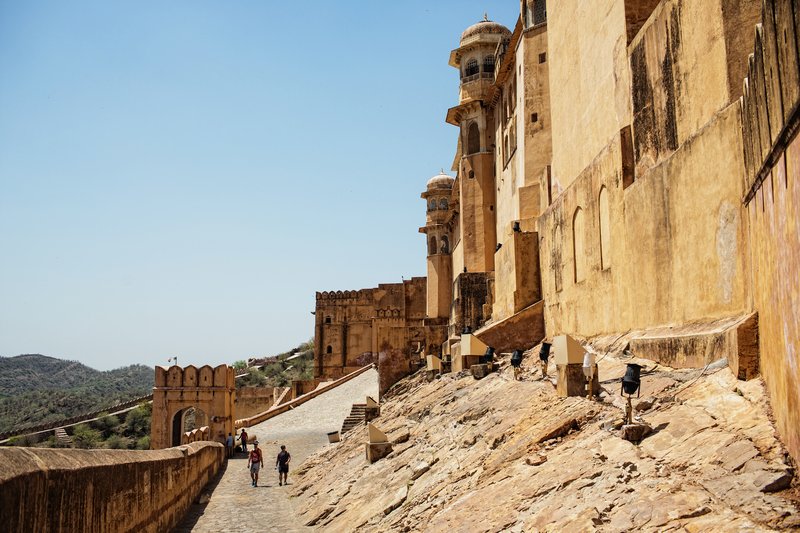 I love history and culture, and to see the famous forts in each city of Jaipur, Jodhpur and Jaisalmer – I tried to imagine myself walking through those narrow streets or battlements hundreds of years ago. 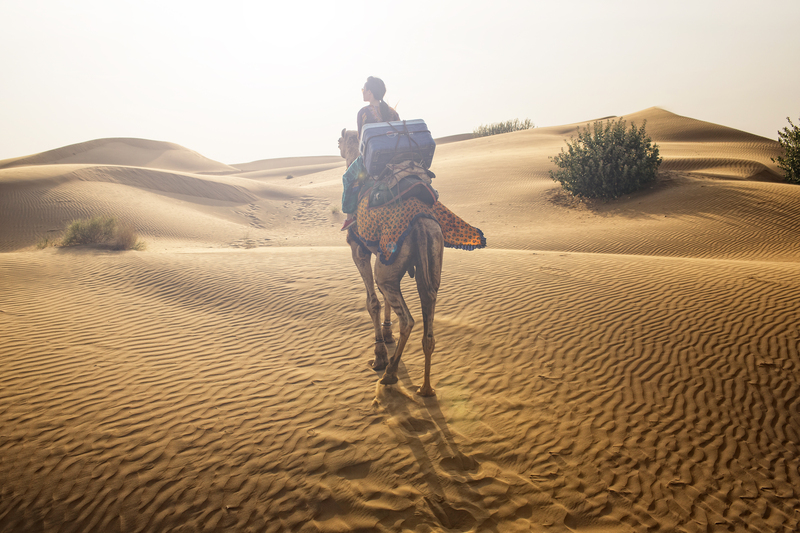 We wrapped up India in a relaxing, albeit slightly hot and painful manner. 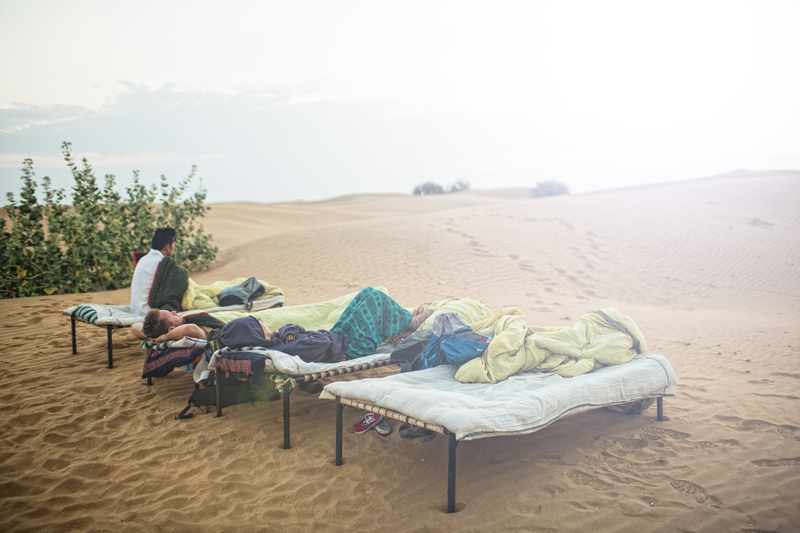 Camel riding in the Thar desert, and slept overnight on the sand dunes. A nice and surreal way to end what had been one of our most physically tiring trips so far, in terms of duration spent driving, flying and training it. Add in white water rafting, para-gliding and that unforgettable and arduous ‘little’ hike we did in the Annapurna. I hope to return as soon as possible! 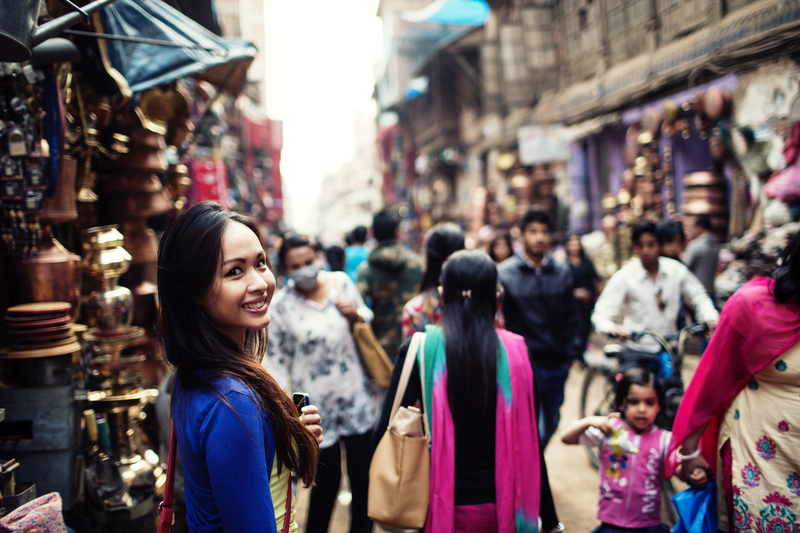 Our first day in Kathmandu, finding our way to Durbar Square and trying to get through the afternoon traffic. 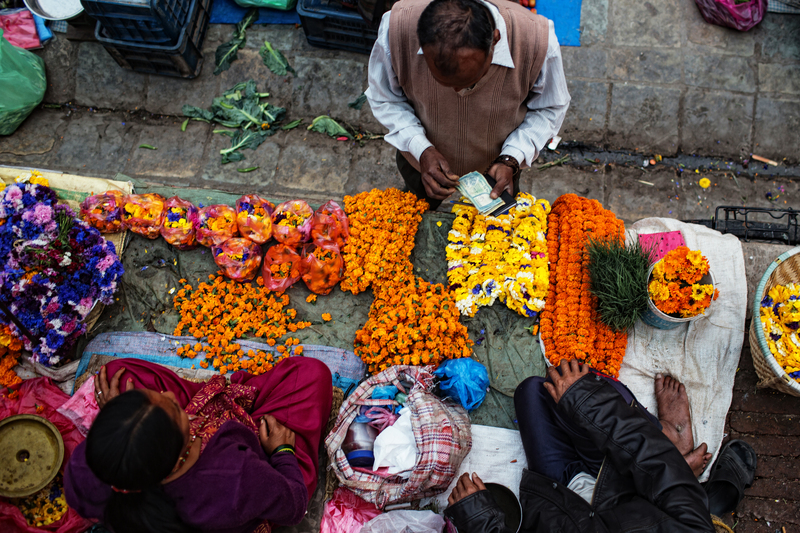 Local sellers in Durbar Square in the late afternoon. 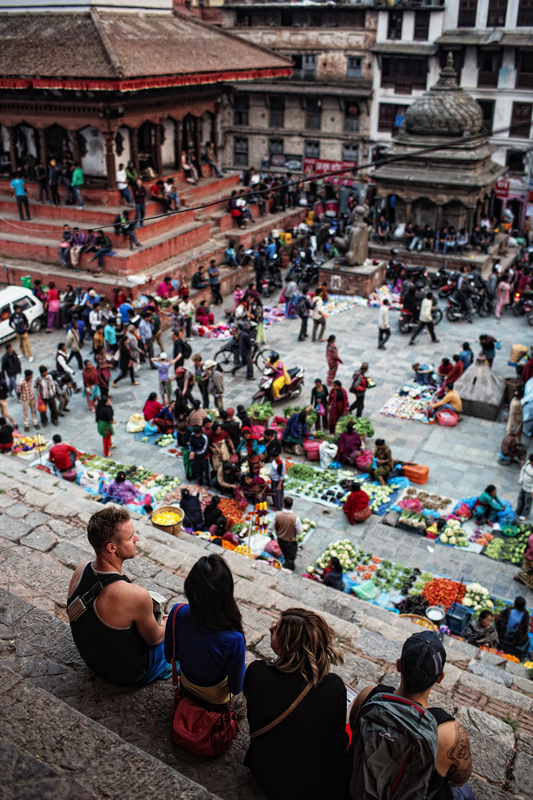 People watching in the local market – Durbar Square. 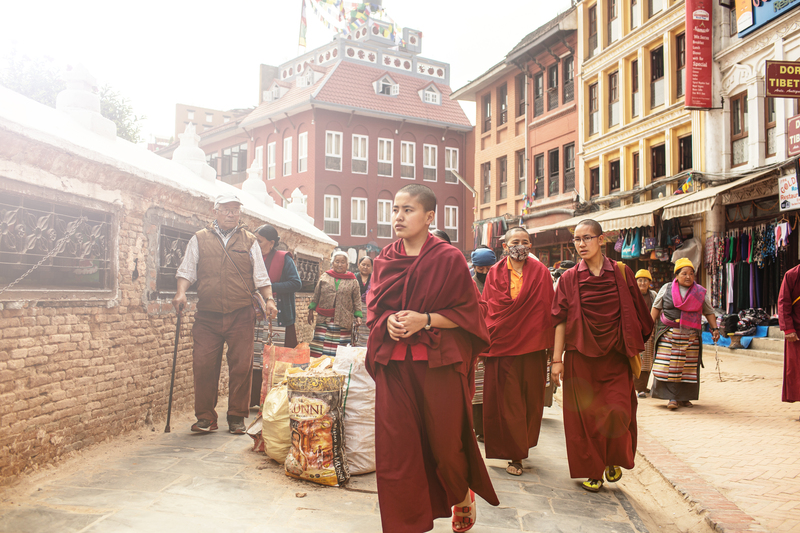 Young monks at the Boudha Stupa – Kathmandu. 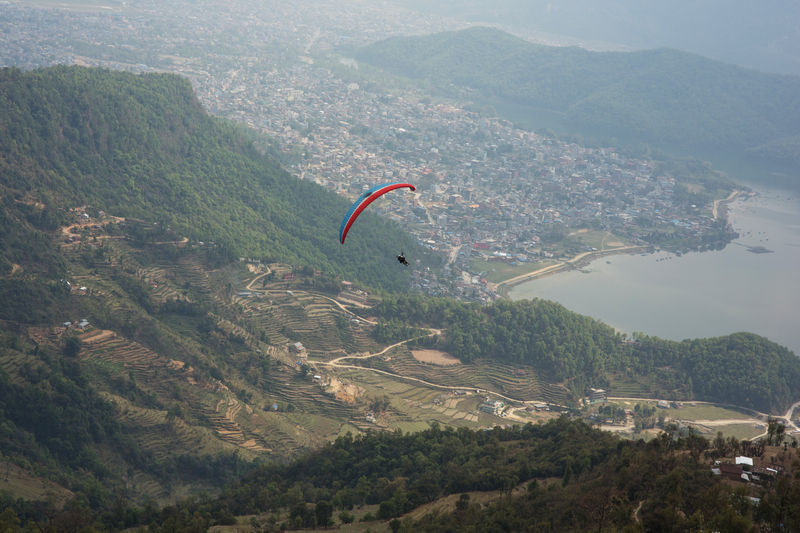 I shot this of a fellow para-glider in front of me whilst up in the air, with Pokhara and its serene lake in the background. 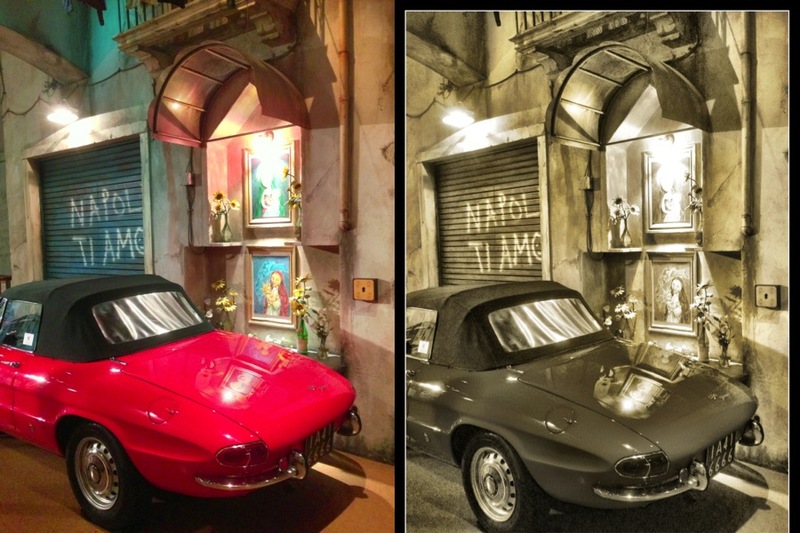 One of the most unforgettable nights I ever had on my travels around the world. Sitting around the village campfire getting to know travelers from around the world and sharing food with the local women who looked after us. 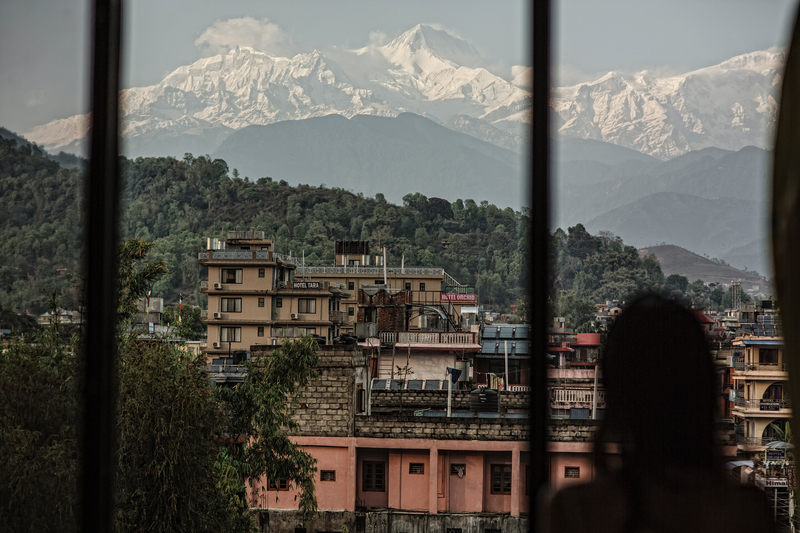 Stunning view of the Annapurna Range when the clouds lifted from our hotel room, with Diana in the foreground. 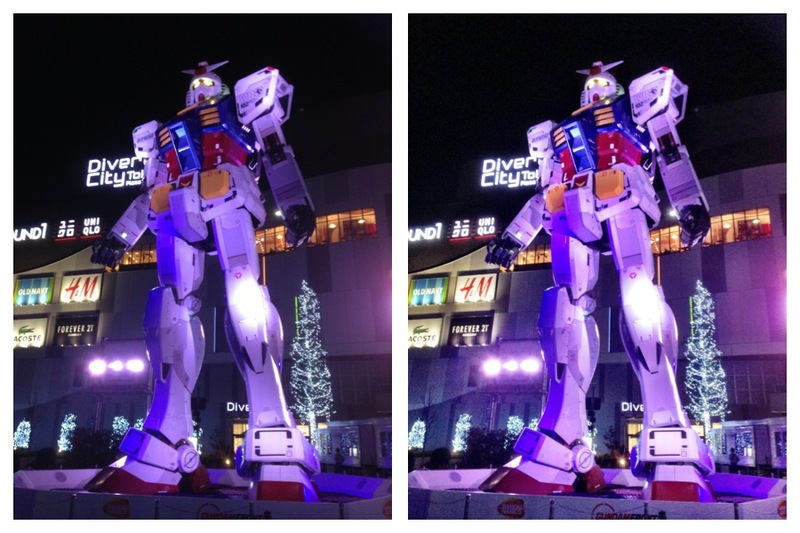 We all rushed to take photos when it became visible. There is a certain beauty in the aesthetics of Amber Fort in Jaipur, the flowing walls and layout made for a less imposing structure than another photo below in another city. 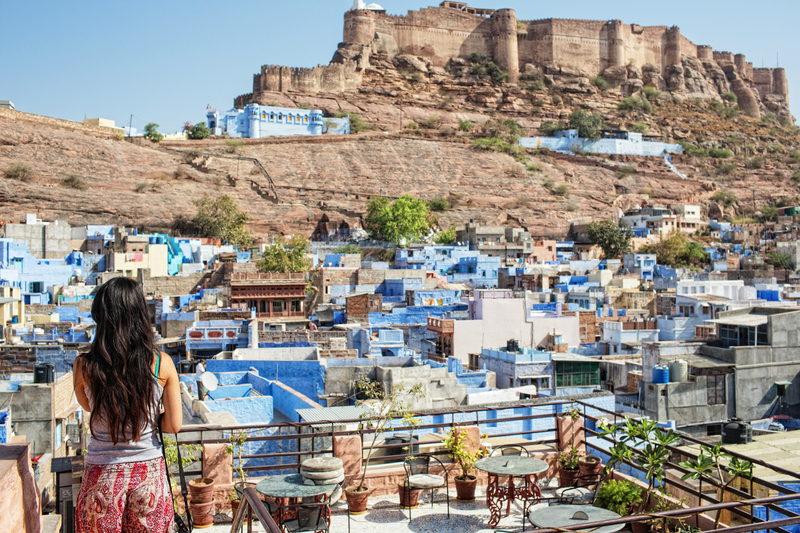 Mehrengarh Fort in Jodhpur the blue city. 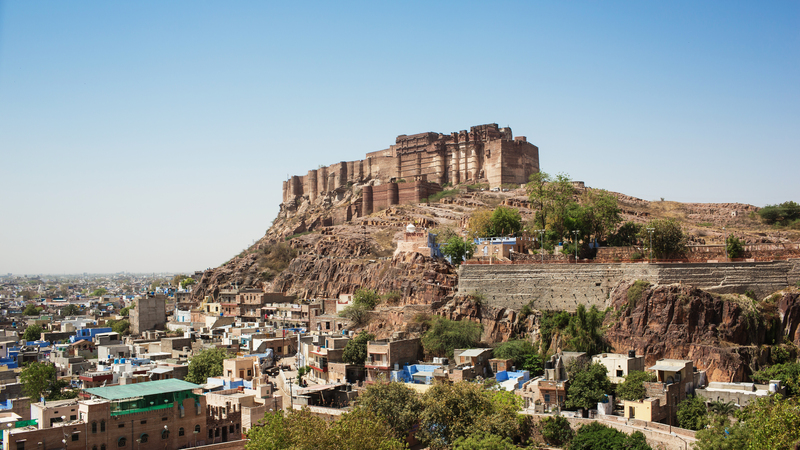 Atop the hill overlooking the city, its imposing structure stands at a vast contrast to Amber Fort in Jaipur. It has never been conquered by any army. The view of Mehrengarh Fort from our haveli. You can see why this is referred to as the ‘blue city’. Another fort, this time in Jaisalmer in which we stayed inside and was a highlight in terms of exotic locale and customer service. The city of Jaisalmer resembled something from the Middle East in some parts, you wouldn’t think you are still in India. 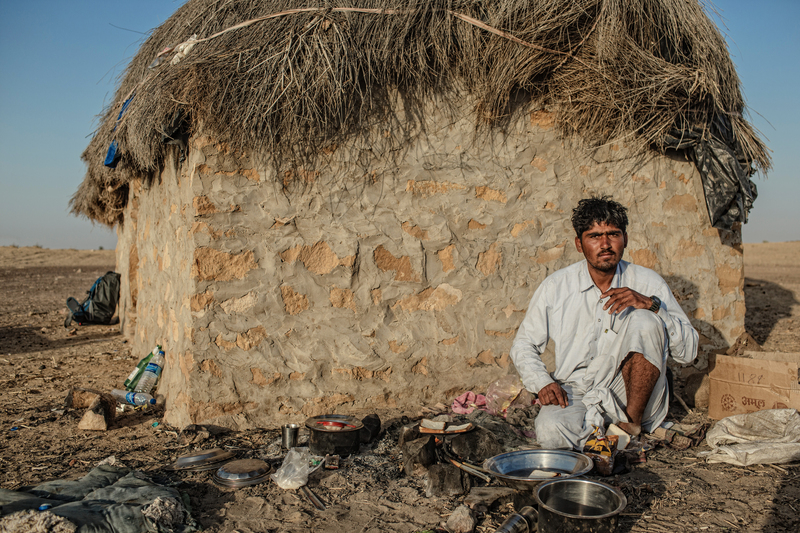 This was the moment we woke up in the early morning in the Thar desert. Inside our accommodation in Jaisalmer Fort. One word = colours! 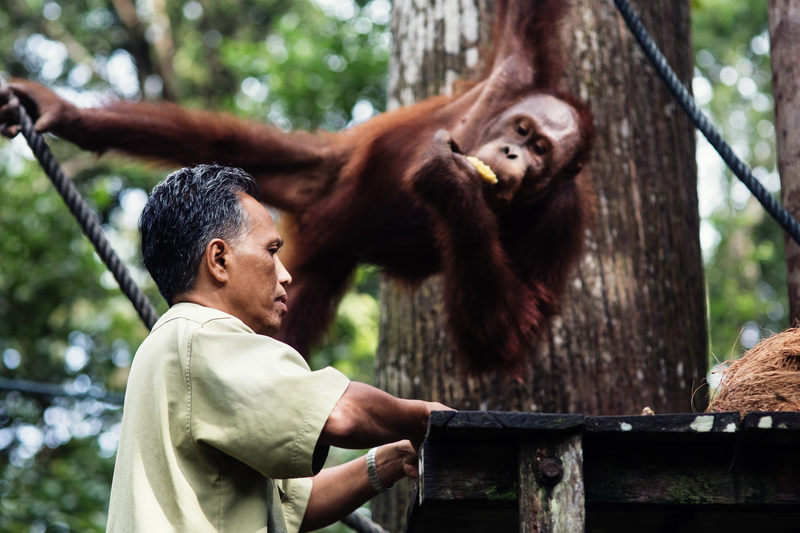 A few weeks after coming back from a stunning road trip of South Island in New Zealand, we were off to Borneo to see the Orang-utans, and for me to do a story on them and interviewing staff there. We had not been to cities like Kuching, Penang and Langkawi island so this was a good opportunity to knock them all off at once before heading over to the colder climate of a Japanese winter. 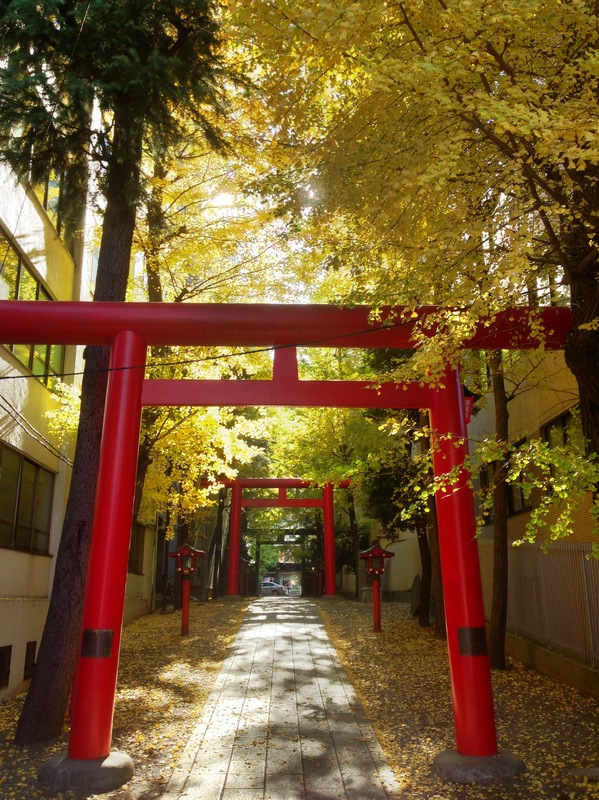 Coming back to Tokyo was a moving experience. It was one of the two cities I had first explored when I begun my traveling in 2007, and to see old and new places again was amazing! 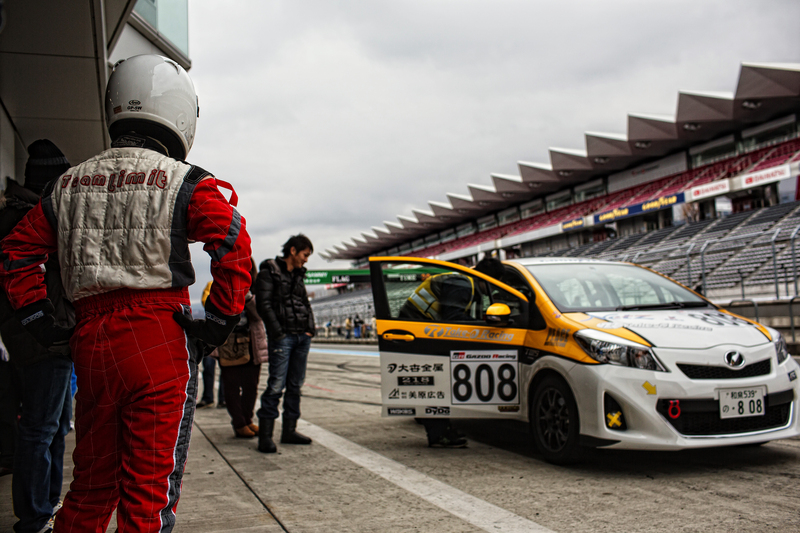 My biggest highlight was masquerading as a foreign photographer and wandered onto the Pit area of Mt Fuji Speedway during a regional race – Toyota Vitz Endurance Cup. I had always been fascinated with this legendary race track from watching it on TV and through video games such as Gran Turismo series. But to actually stand next to teams making pit stops and race officials poring over race data was a surreal moment! 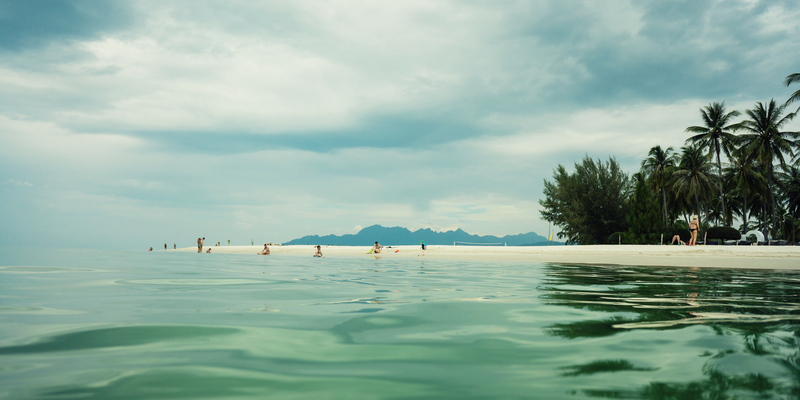 On a beach in Langkawi, overcast day and poor visibility meant it was useless for diving or any underwater snorkeling shots! Messing around in the water with Diana, shot with the Sony NEX5N in an underwater housing half submerged. Behind the scenes shot of feeding time for some Orang-Utans. Back again, after 7 years since I was at Mt Fuji! 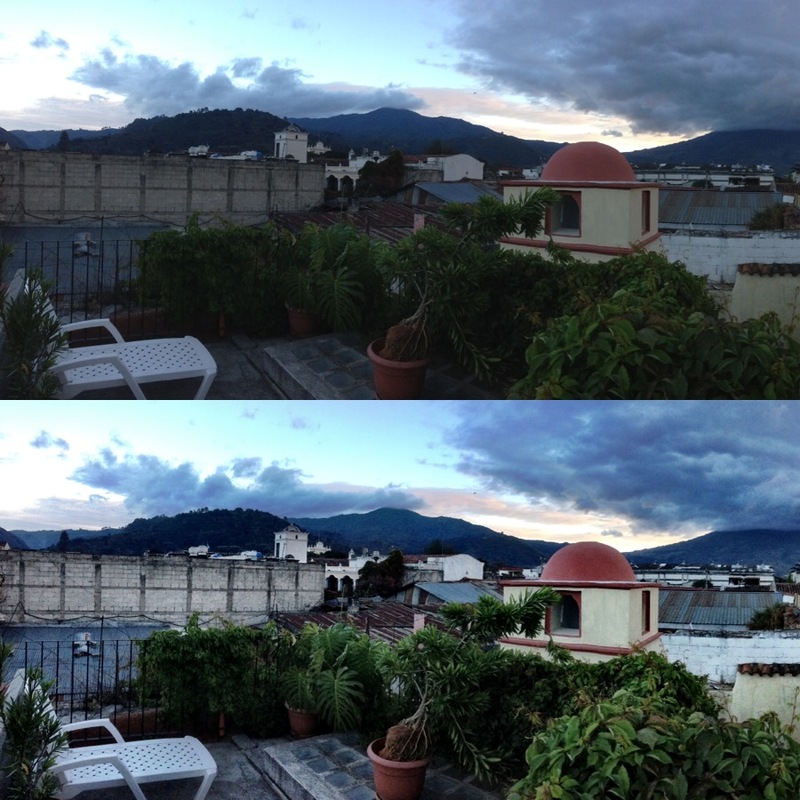 Can you believe this was taken with my iPhone 5!? 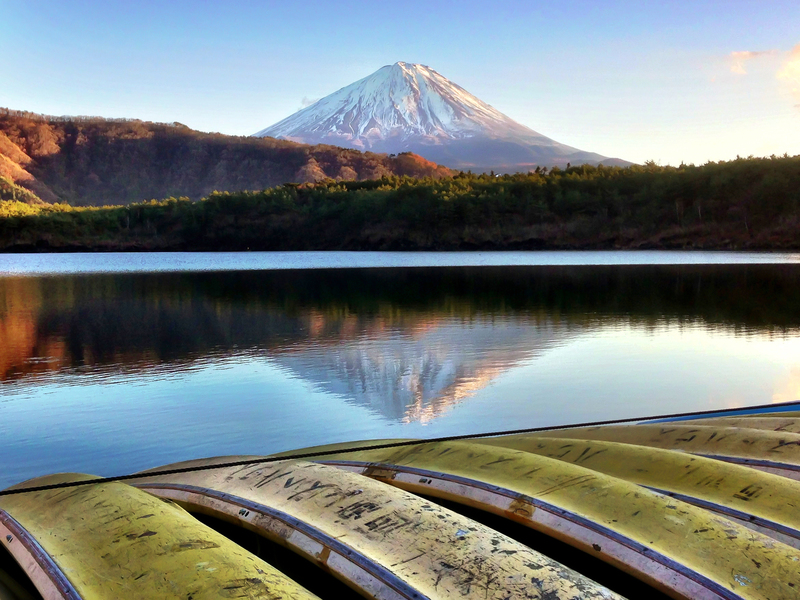 Use the canoes in the foreground to frame the volcano during sunset. 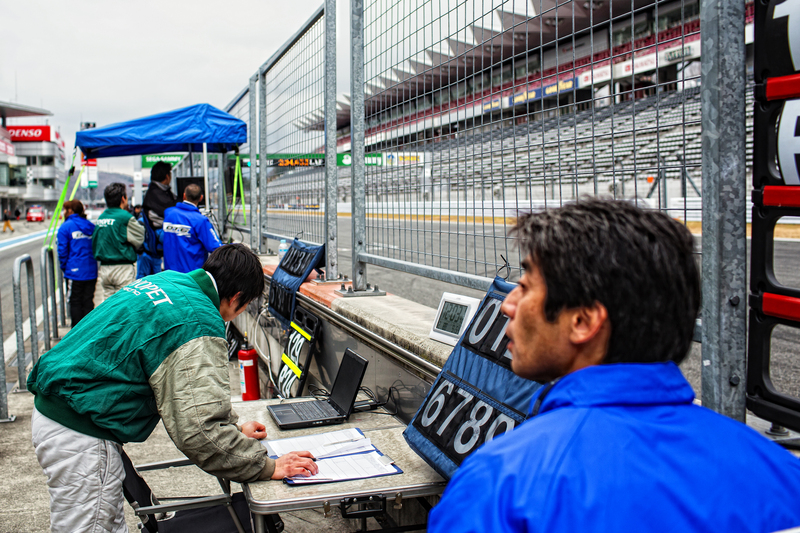 One of my trespassing shots in the Pits area of Fuji Speedway. Masquerading as a foreign journalist, I was able to sneak onto the pit area and watched several teams change drivers during the Toyota Vitz endurance race. Track officials monitoring timing and conditions on their laptops. Nobody questioned me as I stood there without a badge during the race. I love the camaraderie of the racing teams at Fuji Speedway. Here are a group of women handing out free hot food to team members and officials and grid girls during the cold winter morning! If you know anything about cars, sometimes the parking lots of Japanese race tracks and drag strips is more interesting than whats being raced! 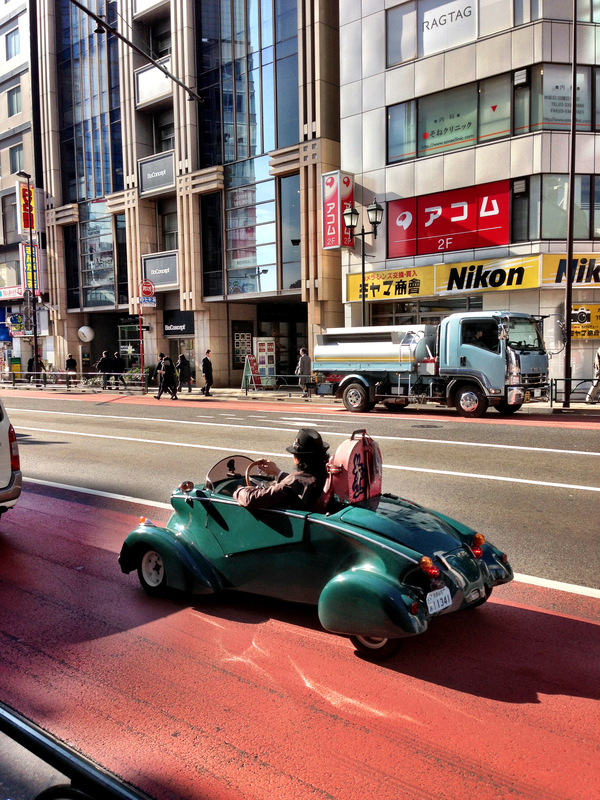 There were plenty of awesome modded cars and quirky ones. But this is one of my faveourite. 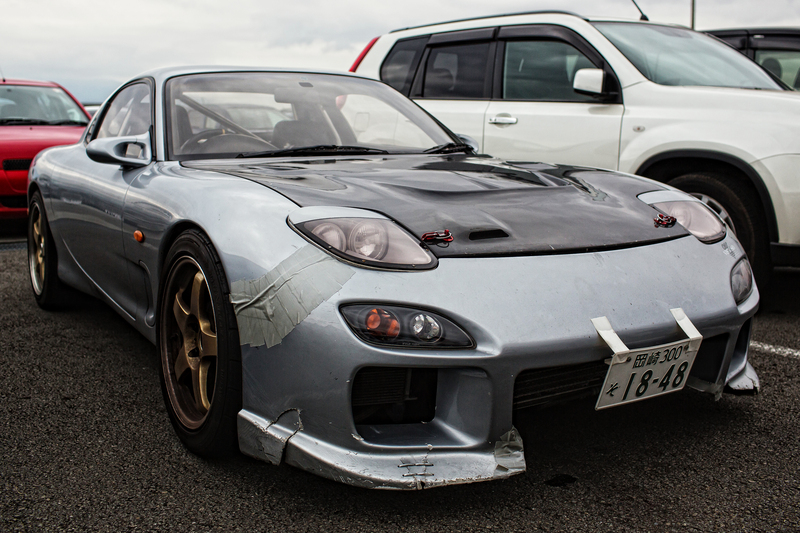 I had always been a fan of the FD RX7 and to see one that is a daily thrasher with street damage and all, made my day! 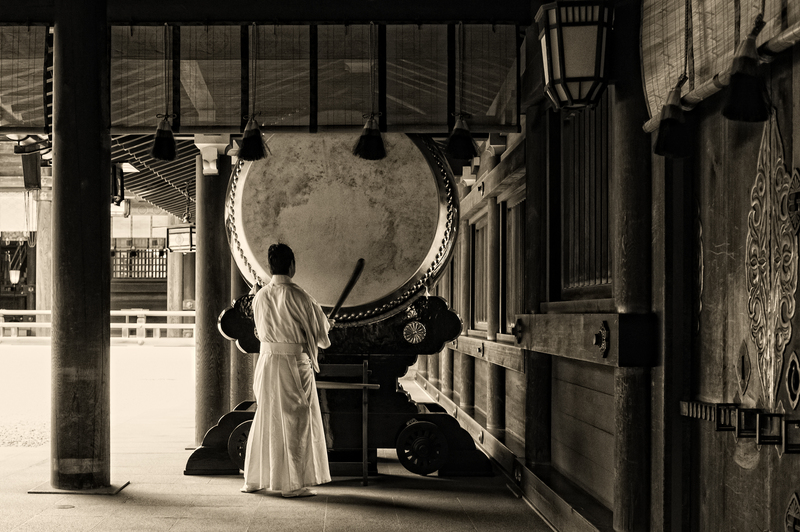 A ceremony at the Meiji-Jingu Shrine in Harajuku, Tokyo. A lot had changed here since I first came in 2007. New and upgraded walking paths and new buildings seemed to have slightly diminished its tranquil setting in the heart of Tokyo. Someone famous having a photoshoot at the Meiji-Jingu shrine. We had no idea who we was but asked for a photo together anyway! 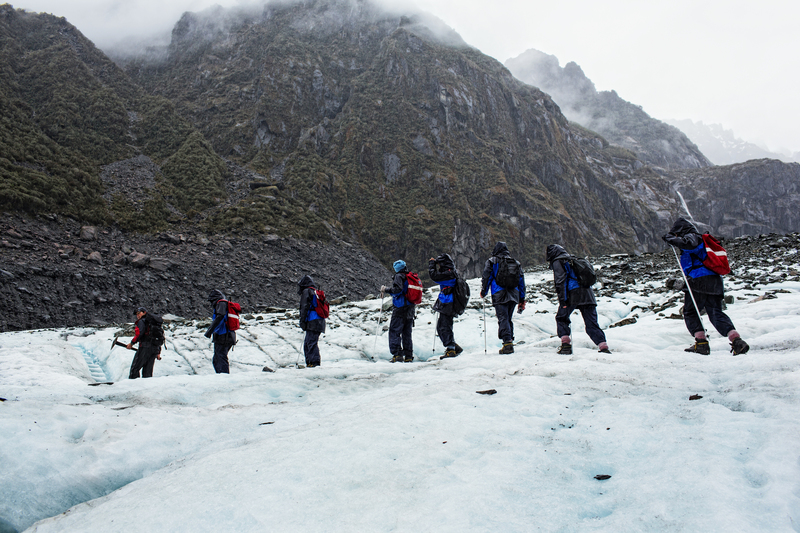 It was a surreal, yet raw and brutal experience – being able to walk on a gigantic glacier shaped by the forces of nature. While the occasional rock falls sending down tonnes of rocks would echo loudly in the valley making us weary of our paths. It was brutally beautiful, that sheer wall of white and blue ice amongst an almost alien and colourless landscape. There were no human comforts to be found here. 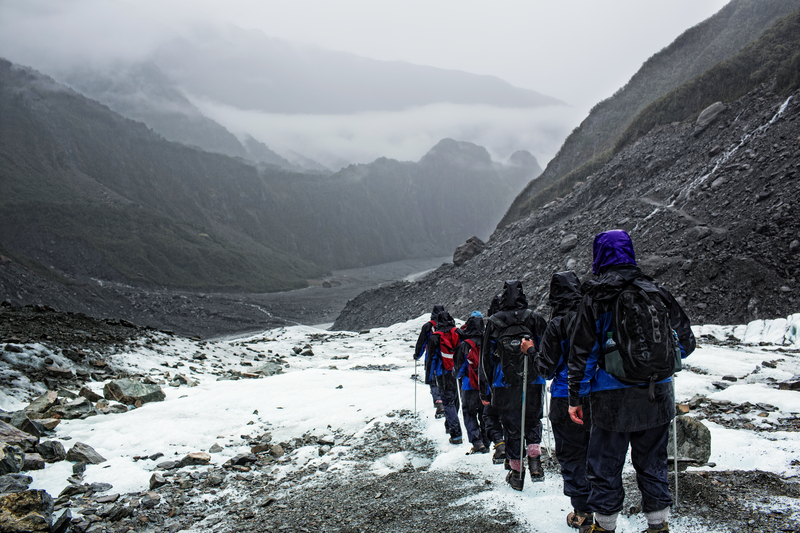 Fox Glacier, on the stunningly rugged and beautiful South Island, New Zealand – is a 13km long ice glacier that is formed in the Southern Alps and ending near rainforests and the township, which serves as the gateway to exploring this natural wonder. 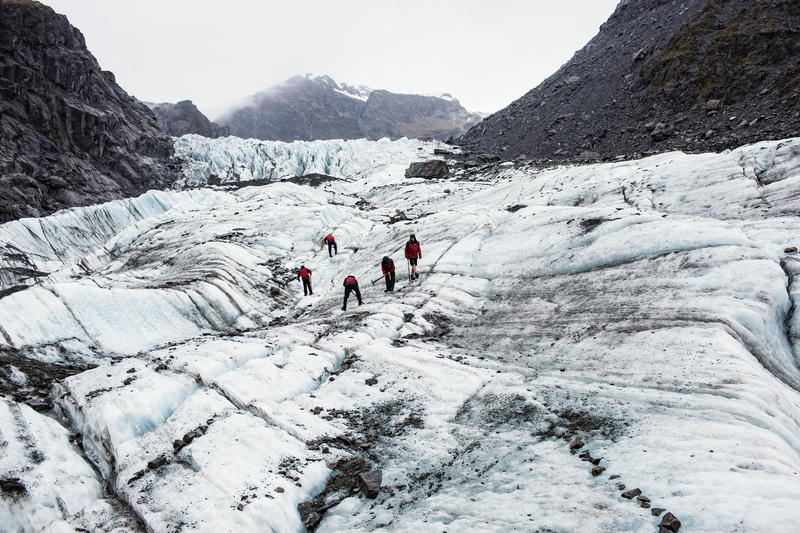 The tours to the glacier are easily booked and can accommodate all levels of age and fitness – with helicopter tours and landing on the glacier naturally being the most expensive. 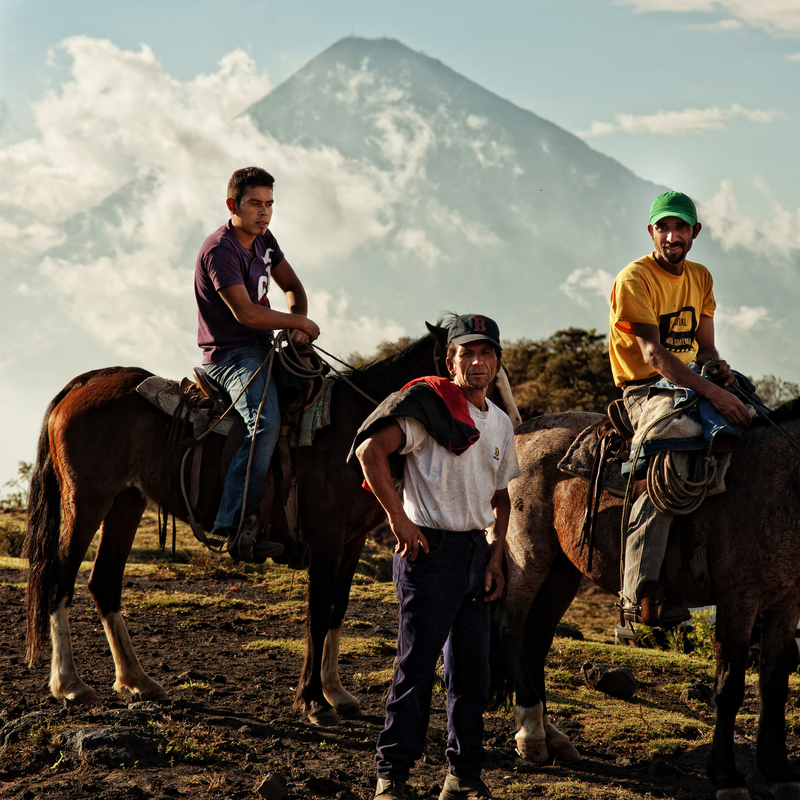 This is no place for ignorance and silliness, as safety is of the utmost importance to both visitors and tour guides. 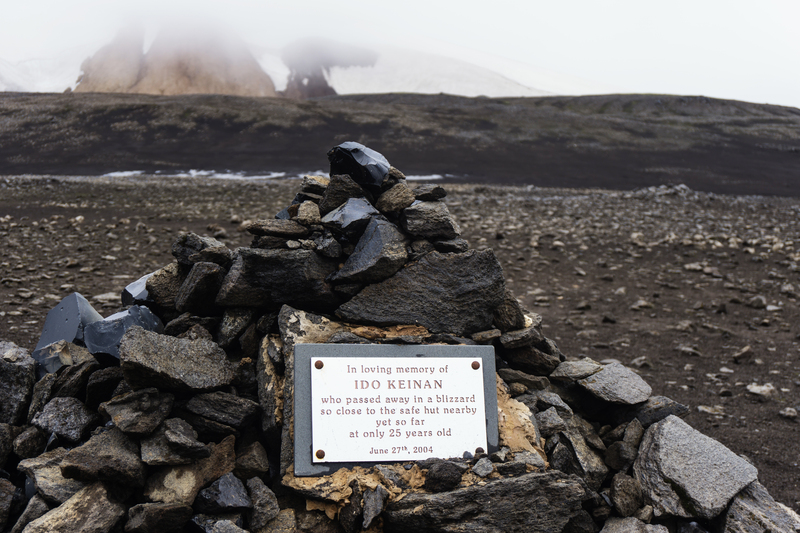 With the most recent deaths being in 2009 when 2 Australian tourists ignored warnings and safety barriers and were crushed by over 100 tonnes of ice falling. 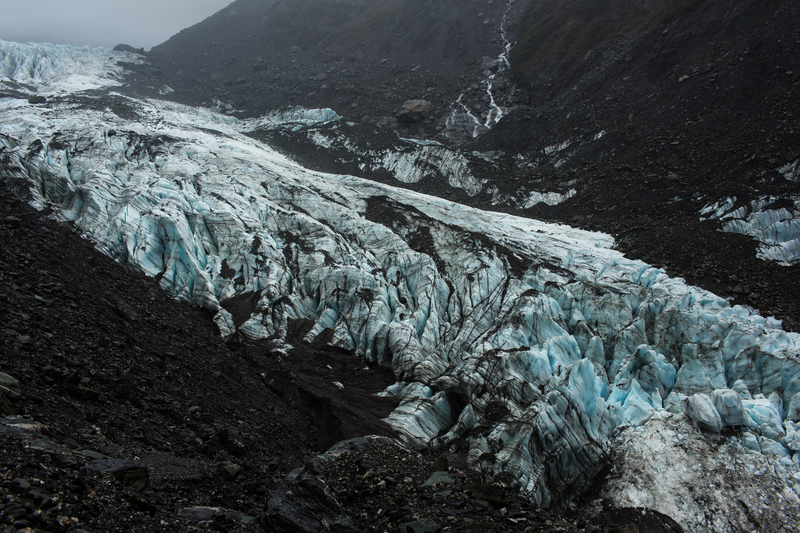 The glacier is constantly shifting and evolving so the danger and risk are assessed on a day by day basis. 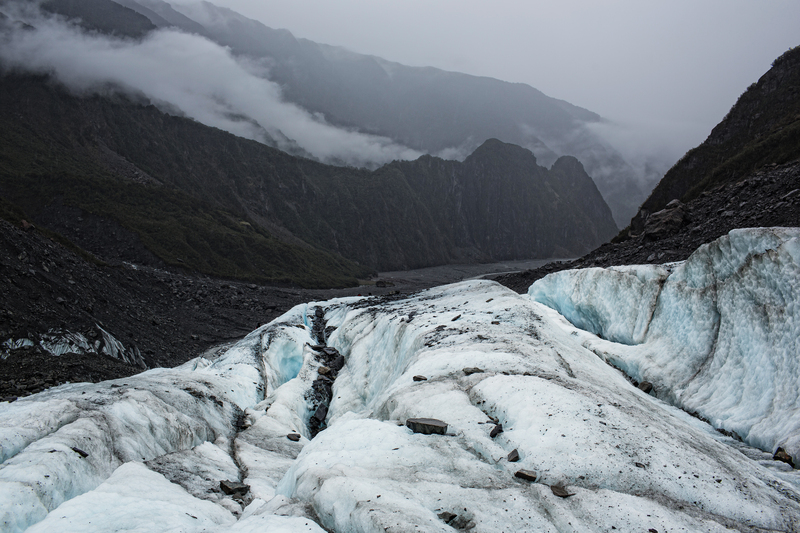 If you ever land on South Island, it is worth making the drive here to visit Fox Glacier, I had done and seen many wondrous things in my life, and this has to be up there with the most memorable of them all. 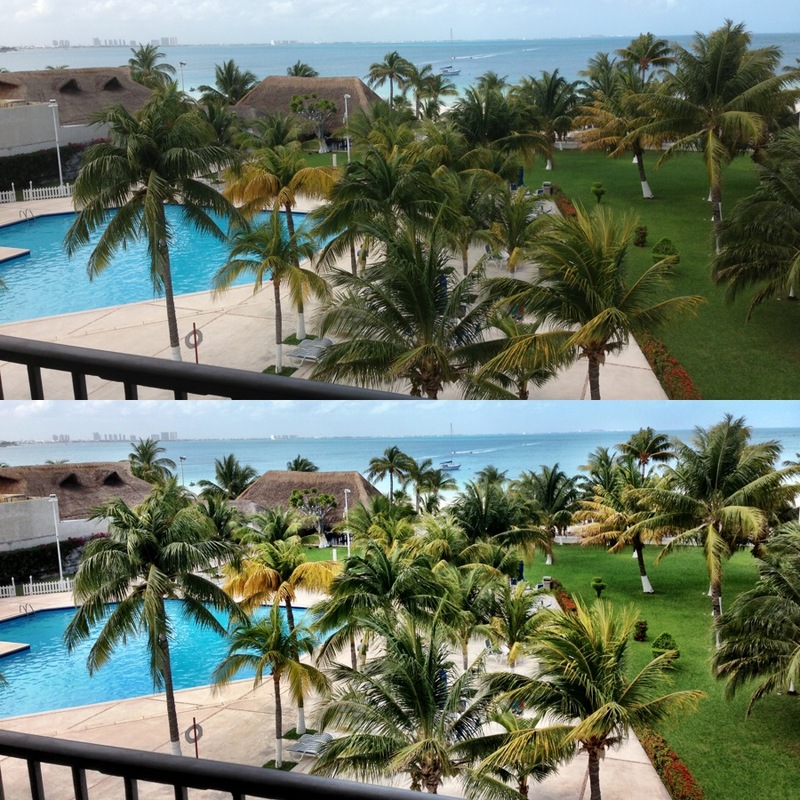 P.S be careful with your cameras if they are not waterproof or weather sealed. Even my Canon 5D3 and lens were deemed highly weather sealed – albeit not as much as a 1D body – but they still got soaked enough from the constant rain over a few hours to exhibit error signs. However this was remedied by me placing it on the bed with an electric blanket to kill any moisture inside. But dont try this yourself! 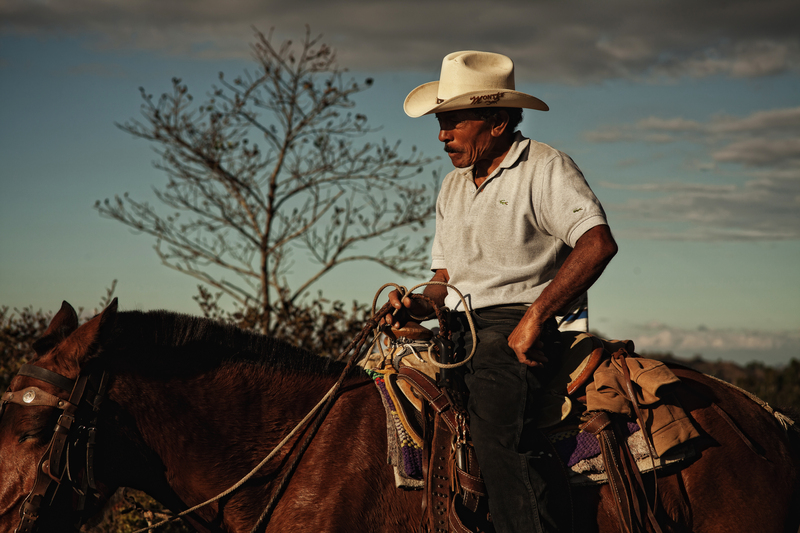 High noon, and somewhere between Belize and Guatemala and close to receiving deep vein thrombosis – I was jammed into a van with 18 other locals from the border town of Melchor after crossing over from Belize. With a 16kg backpack on my lap, and a stranger resting his head upon my shoulders quietly snoring away – I pondered about life. Not because I had a lot on my mind, more so because I literally could not move or do much else. 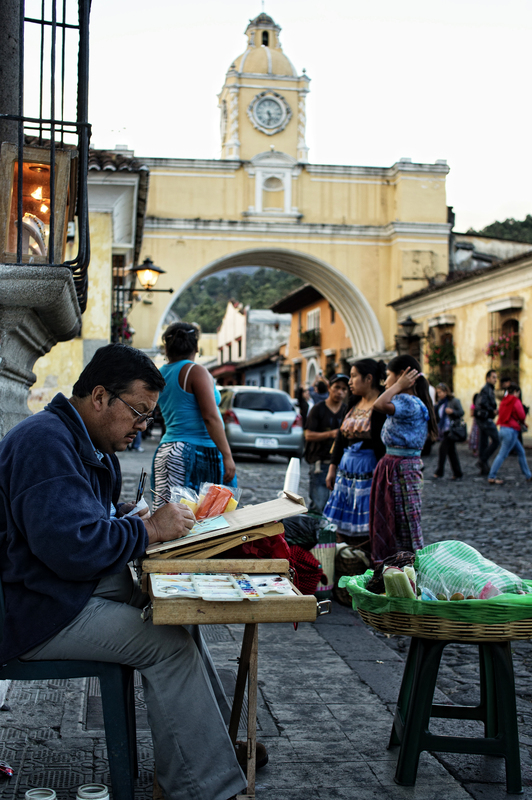 We looked for a way down south, hearing the allure of a historic Spanish colonial town, built in the Baroque style and nestled at 1500m above sea level – sounded like a supermodel amongst a pack of tired, middle aged businesswomen. Tired being the hotel beds in Cancun, or the tired hotel staff putting up with the constant supply of American all-inclusive resort guests’. 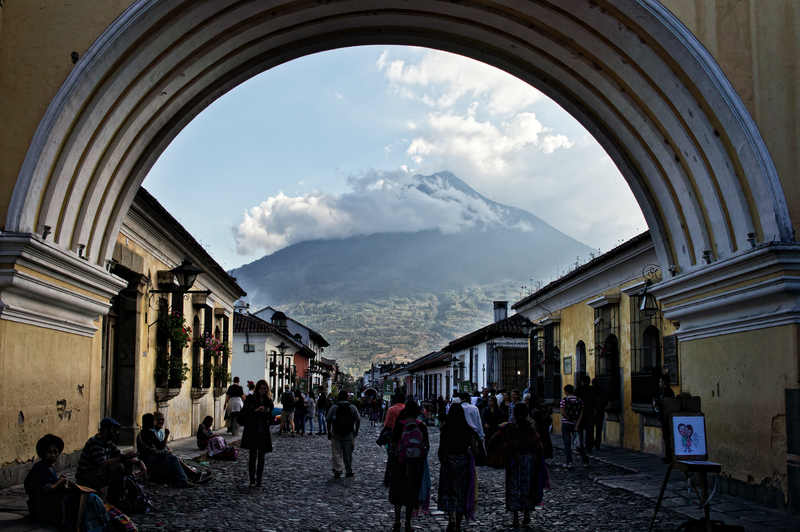 The four days spent in Antigua was filled with seeing quaint wonders – from climbing the still active Volcan Pacaya to wandering the colourful cobbled stone streets – it was a much needed respite after the arduous journey overland from Cancun through Belize to Antigua, with our final destination being Guatemala City 2 hours away, before flying back to Cancun and back to LA. 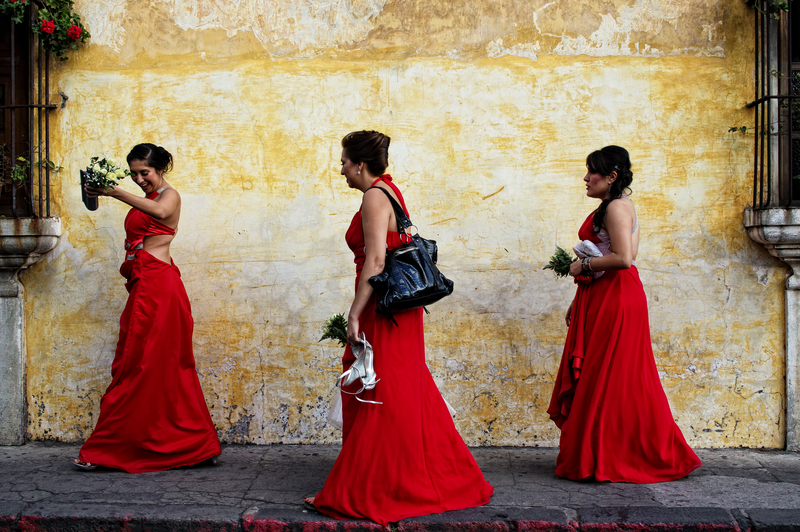 I had never seen so many people carrying shotguns before until I arrived in Guatemala City, from shopping mall guards, car parking attendants and bread delivery drivers. It was shotgun heaven for enthusiasts. But that is inevitable from the very high crime rate in the capital city. I was glad to leave the capital after an uneventful night there, otherwise there would have been a lot of ball bearings flying around! 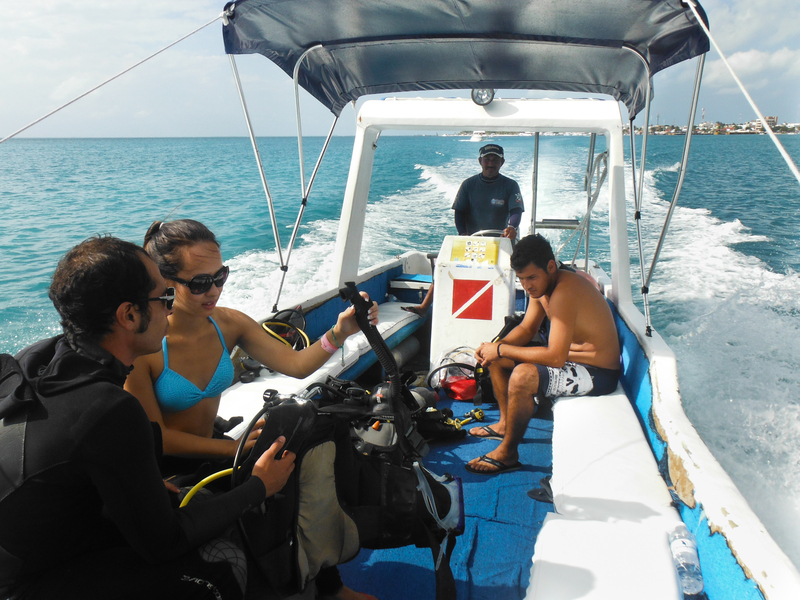 I consider myself to be an enthusiastic scuba diver, albeit a novice one with the occasional dive whenever I am overseas and weather and location permits it! 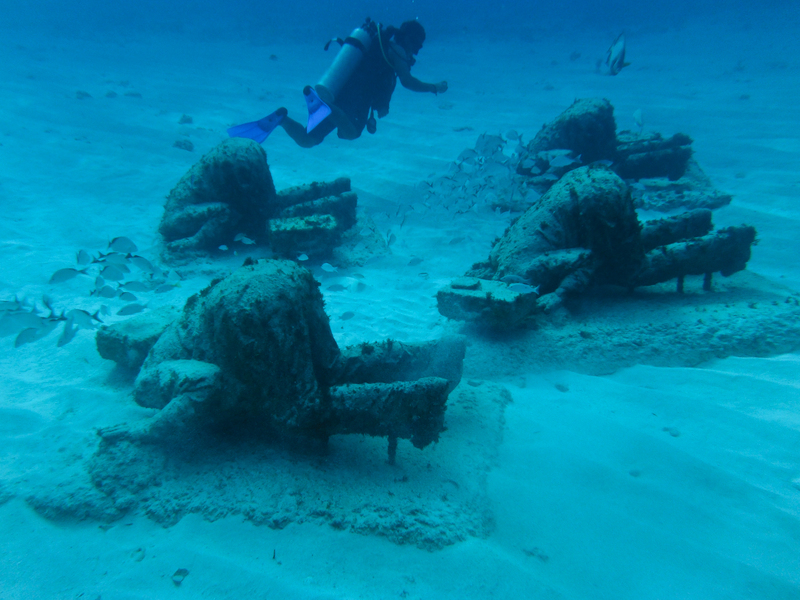 As diving in Adelaide isn’t that great with visibility usually low etc. 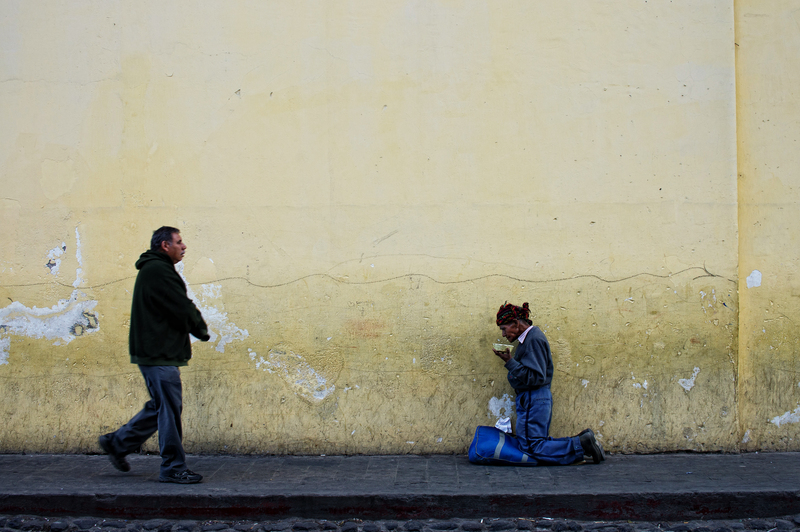 On a recent trip to Central America starting in Mexico, I had planned to dive MUSA – which I read about online. 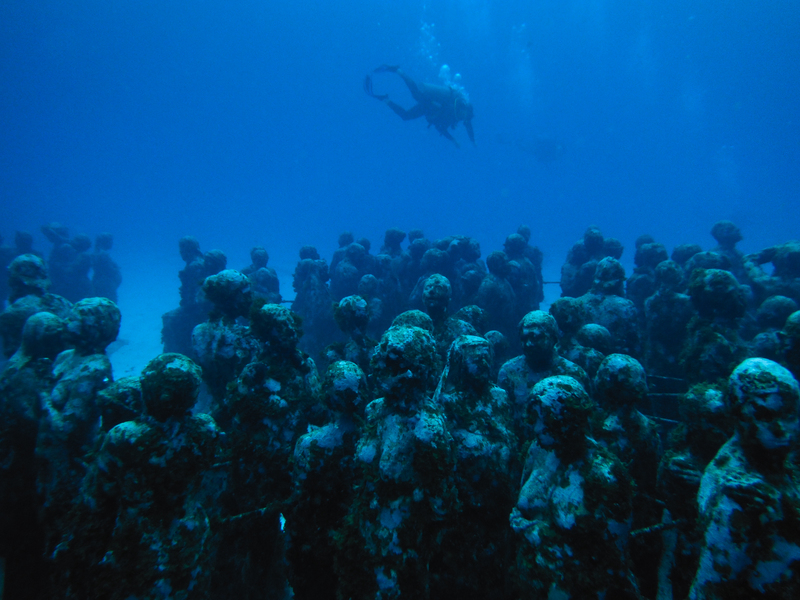 We were lucky enough to be able to visit one of the artistic and diving wonders of the world, a vast underwater museum and sculpture off the coast of Isla Mujeres and Cancun, Mexico. 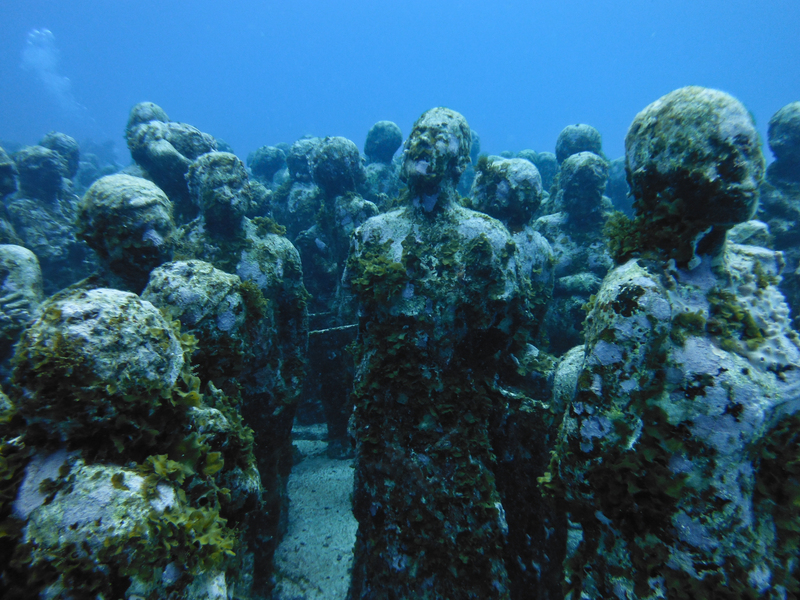 Created by artist Jason deCaires Taylor and other artists, it was utterly surreal to see everyday things and people, 5-10 meters below the water. Unfortunately, we commenced our dive at the onset of a torrential downpour and after 1 tank we decided to go back to shore. For this series I used a cheap Fuji waterproof camera which cost round $140, if I had my DSLR and underwater housing the image quality would have been vastly different with the added ability of shooting in RAW to edit! 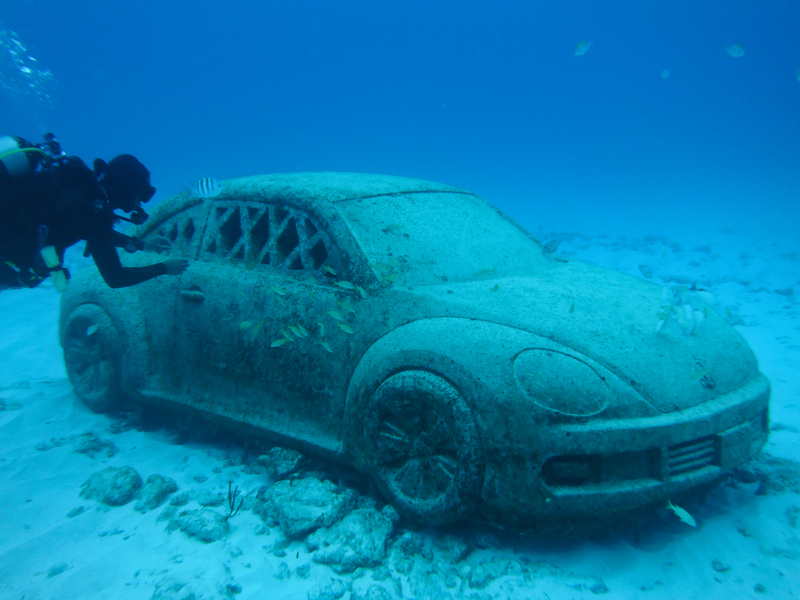 For anyone interested in photographing this, there is currently no facilities in Cancun that offer rental services on underwater housing or specialized cameras. Best to bring your own equipment for now.